I recently picked up a box of 2011 Bandai Owners League 04 from a seller on Amazon.com - and in this case I do mean the US Amazon.com. 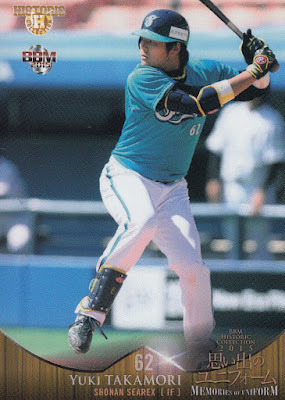 Jay Shelton had been telling me for a while that these were available fairly cheaply but I usually don't do much with the collectible card game cards so I never did anything about it. But I recently discovered a reason to be interested in these. Let me explain. BBM issues two "flagship" sets each year - the 1st Version set that is published in mid-April and the 2nd Version set that is published in mid-August. Both sets go to press much earlier than that - I suspect that the 1st Version's cut off is mid February and 2nd Version's cut off is around the end of May. 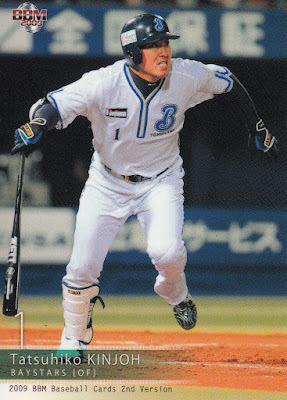 But the "trade" deadline for NPB is the end of July - this is the latest date in the season that a team can add a new player. 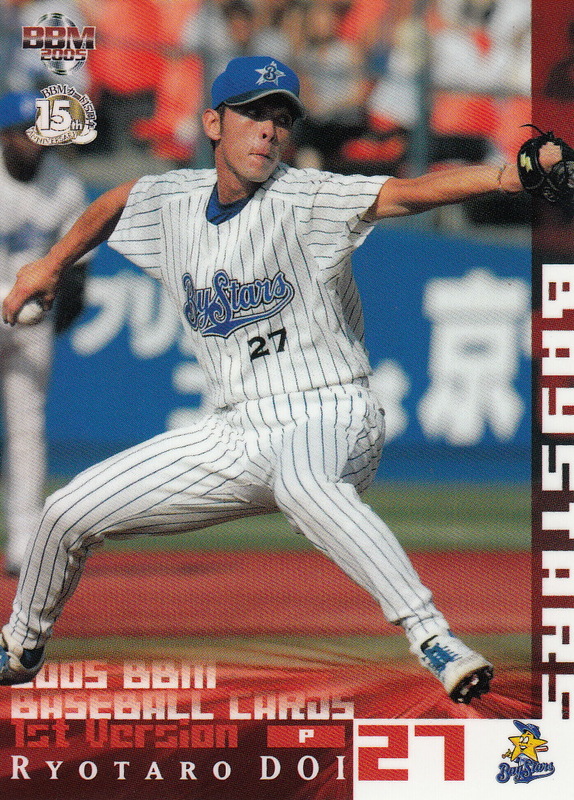 So there's two months of the season where a team could sign a new player or make a trade that would not be reflected in one of BBM's flagship sets. 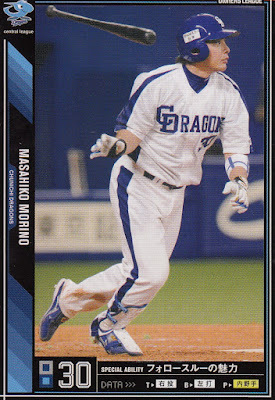 Now BBM does publish their high end set in mid-September but that tends to be a small set and most likely won't include any newly acquired players. 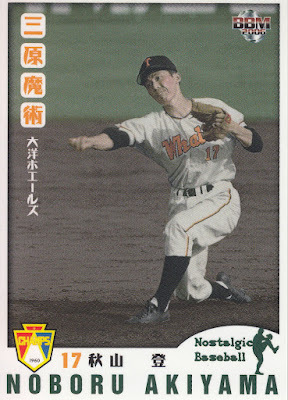 Calbee also puts out a set in mid-September but it is a small set too - and usually it contains players who were also in their earlier sets for the year. 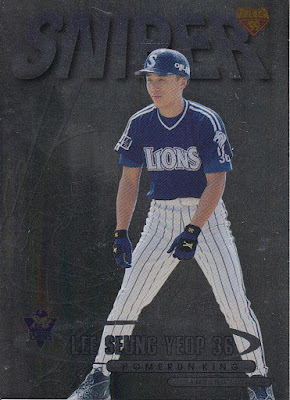 So the chances of one of these new or traded players making it on to a baseball card is pretty slim. Or are they? 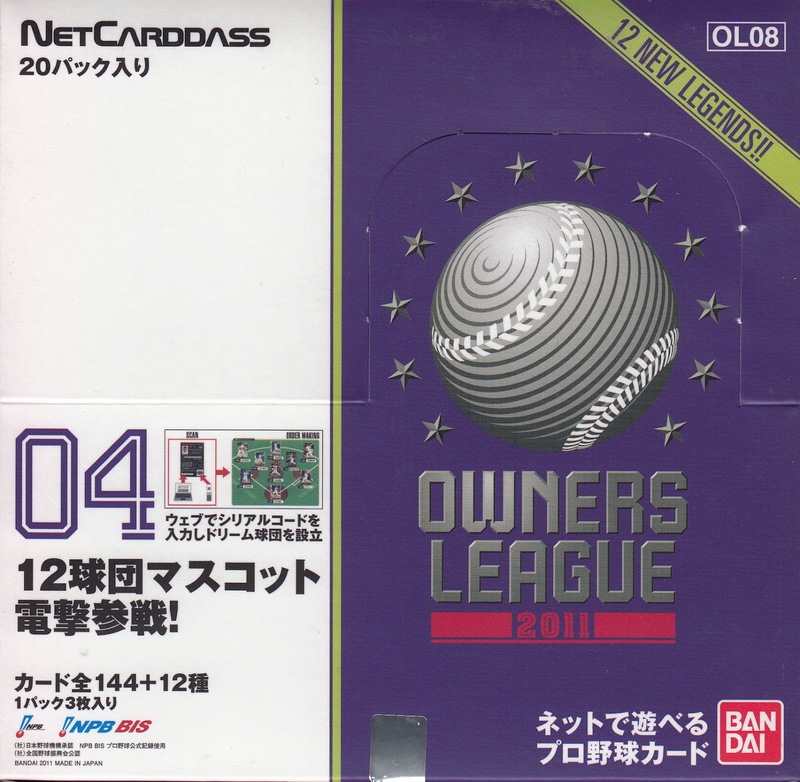 Bandai started putting out the Owner League sets in 2010. They issued four sets a year through last year (looks like they have not published any cards this year) called "01", "02", "03" and "04". I don't know for sure what time of year the fourth series comes out, but it is apparently late enough in the season to get some of these players. For example - in 2010 the Eagles signed former Hanshin Tigers pitcher Keiichi Yabu to a contract on July 31st after he'd spent five seasons in North America. 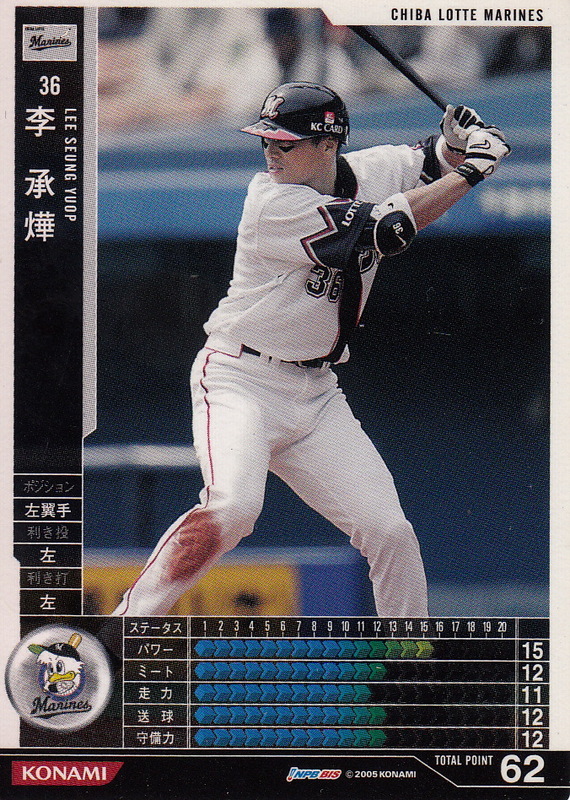 He appears in the 2010 Owners League 04 set - his only other card with the Eagles that I know of is the 2014 BBM Eagles 10th Year Memoral set. 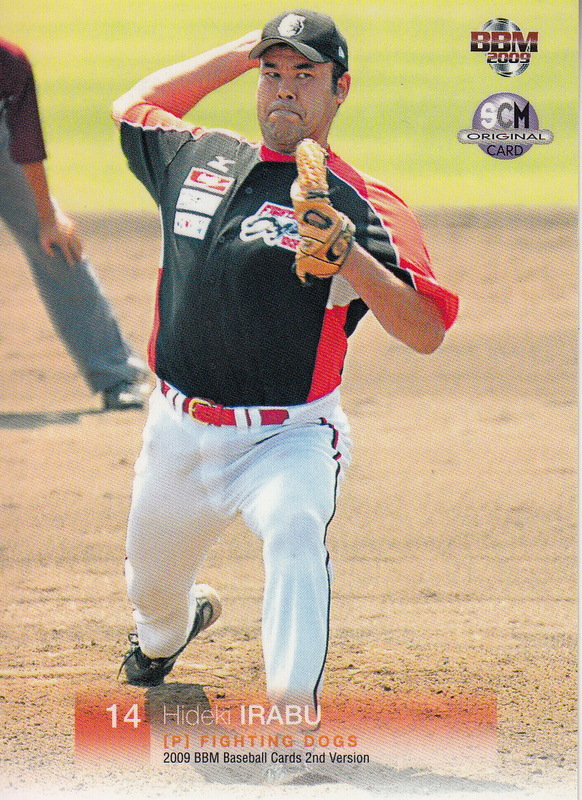 Similarly Alfredo Despaigne, Duente Heath and Nick Evans signed with the Marines, Carp and Eagles respectively in late July of 2014. 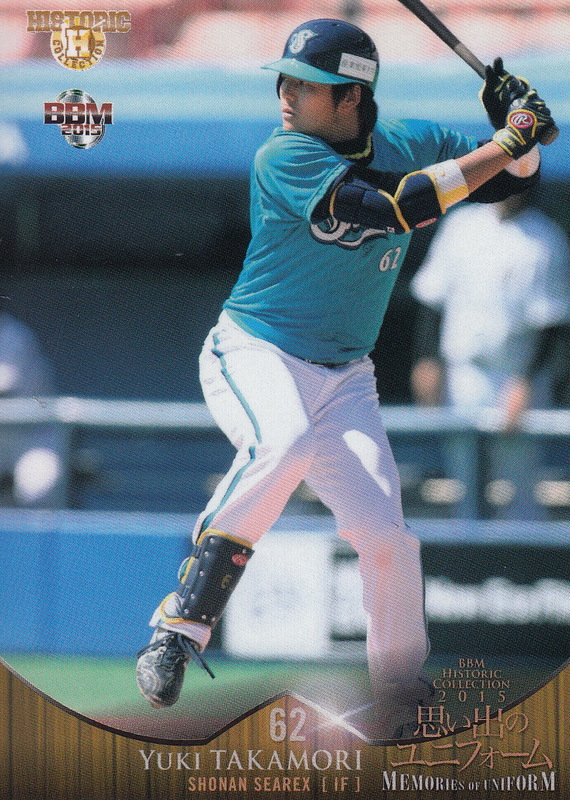 The only BBM cards they had that year were in Sports Card Magazine #107 but they all three appeared in the Owners League 04 set (along with several others who signed after 2nd Version went to press). 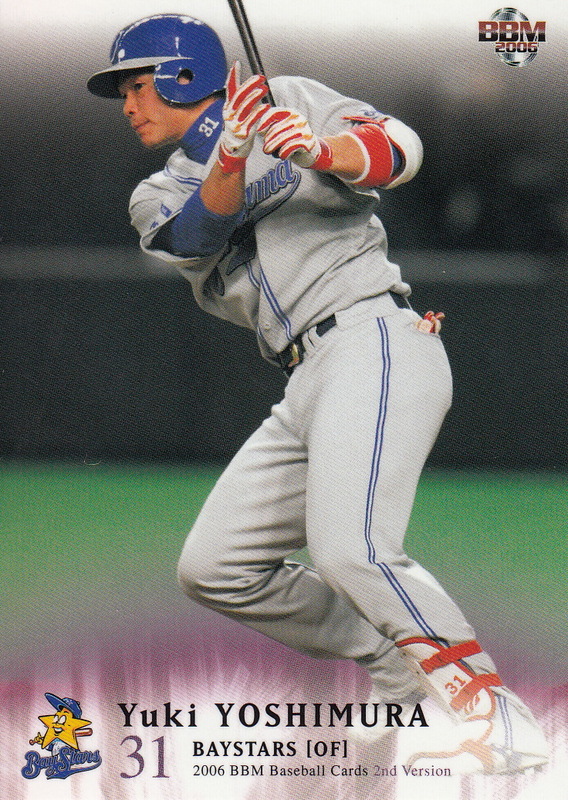 So my curiosity about the "04" sets was piqued and I wondered if the 2011 edition could help answer a question I've had for a bit. On June 30th of 2011, the Yomouri Giants acquired long time Chiba Lotte Marine Saburo Ohmura. 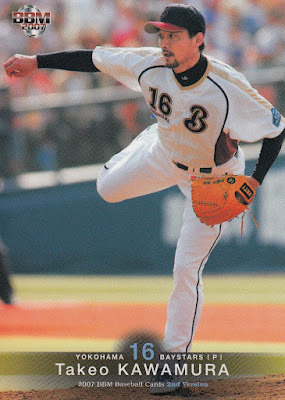 Saburo (his registered name) remained with the Giants for the remainder of the 2011 season but he resigned with the Marines for 2012. 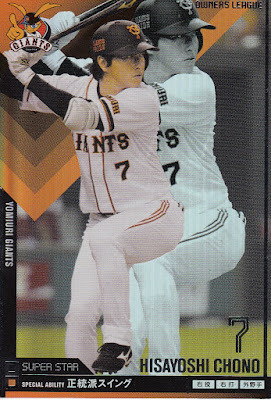 As far as I know, he never had a BBM card showing him with the Giants. So did he appear in the Owners League 04 set that year? 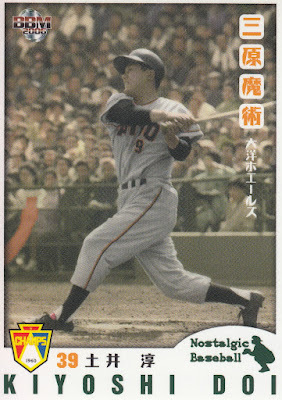 I took a look at The Trading Card Database but unfortunately they did not have the checklist for the 2011 set. But I remembered that Jay had told me I could find these boxes on Amazon and I had just gotten a gift card for my birthday so I decided to give it a shot. I was able to find the box for about $14 and it was delivered a few weeks later. 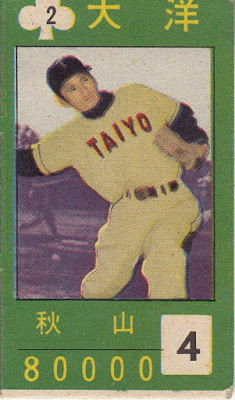 The set itself has 156 total cards, although I think the base set really only has 132 cards - 48 of which are possibly short-printed. There are 12 "Legend" cards and 12 "Idol" cards that I think are considered inserts. 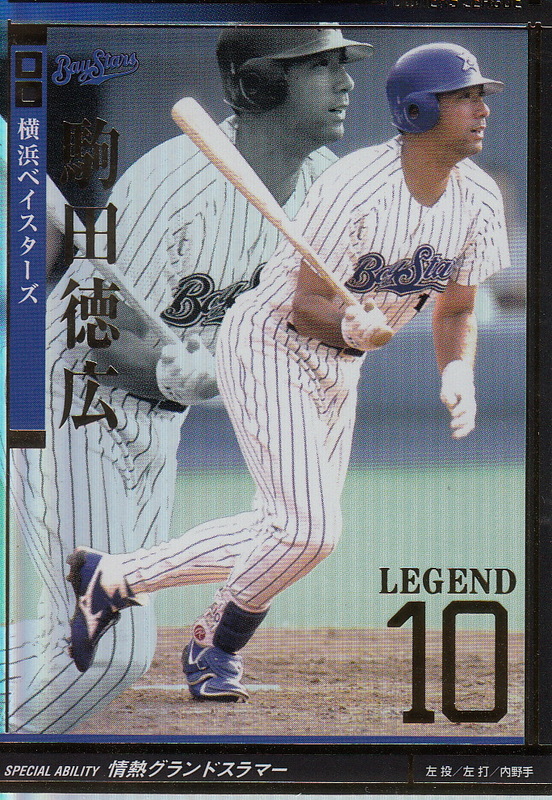 The "Legend" cards feature OB players while the "Idol" cards feature mascots. 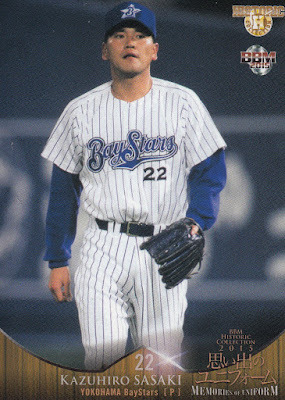 The possible short-printed cards are 12 "Great" cards, 12 "Super Star" cards and 24 "Star" cards. All of these are active players. 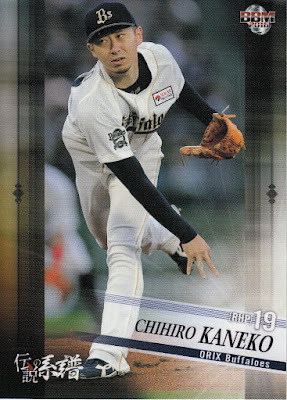 The remainder of the cards are either "white" (48 cards) or "black" (36 cards). 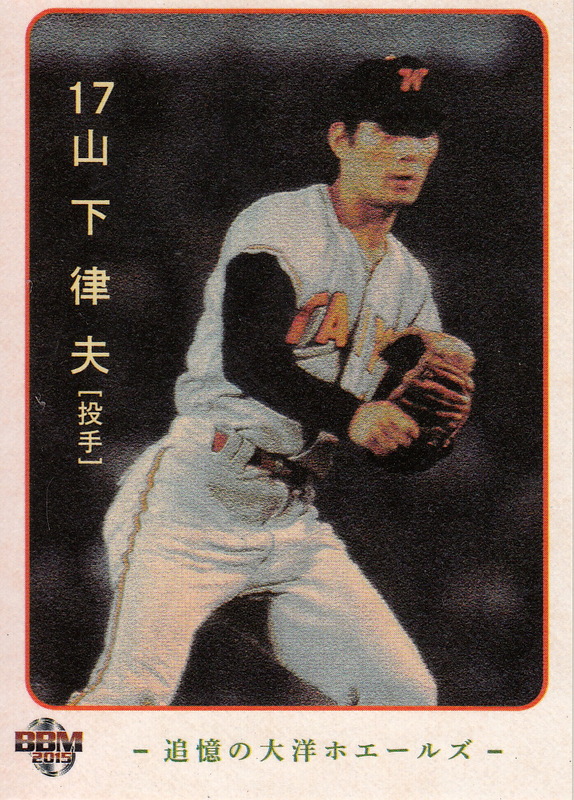 If you hadn't already guessed, each of these groups of cards are split evenly between the 12 teams. 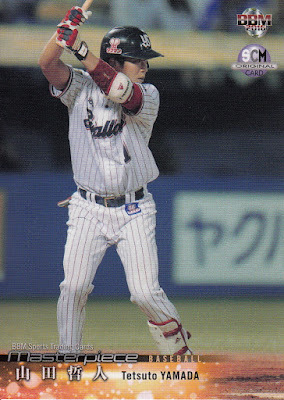 There are several other players in the set that were newly acquired by their teams - Brian Barden of the Carp, Ryan Mulhern of the Lions and Luis Garcia of the Eagles. Barden and Garcia would remain with their teams in 2012 and have BBM cards that year but Mulhern did not return to the Lions so this is his only NPB card that I know of. 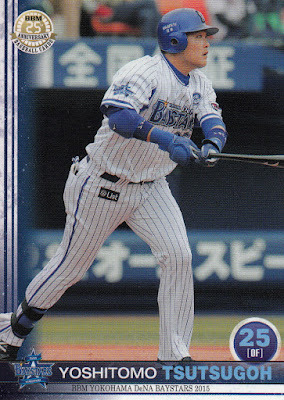 A number of the other players in the set did not appear in either of BBM's flagship sets in 2011 although they did not change teams. And the set also contains a number of bigger names like Masahiko Morino, Norihiro Nakamura, Tomoya Satozaki and Shinya Miyamoto. As you would expect, the short-printed "Great", "Super Star" and "Star" cards are all big names - Kenta Maeda, Yoshio Itoi, and Hisayoshi Chono are among the cards I got. - BBM is celebrating their 70th anniversary as a magazine publishing house this year by publishing a multi-sport set called Masterpiece. 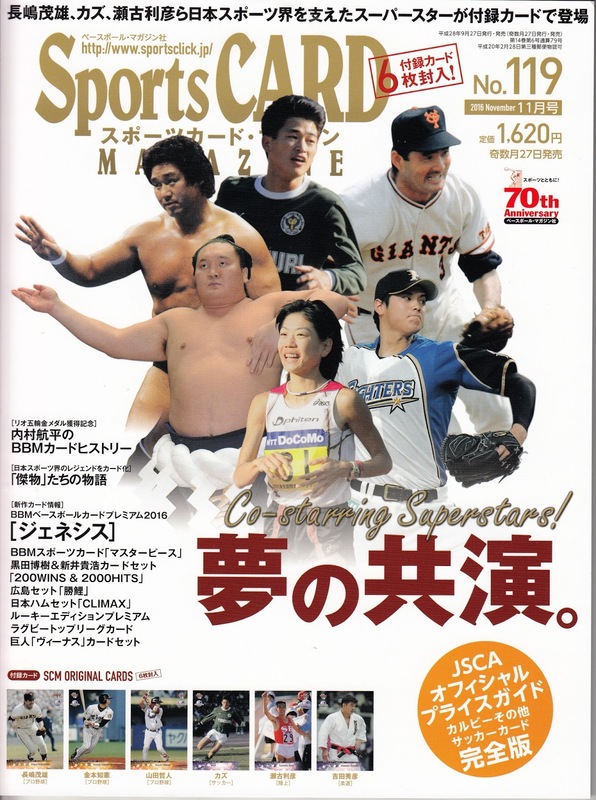 I haven't seen anything about it on BBM's website yet but the details are up at Niki (and of course this issue of SCM). 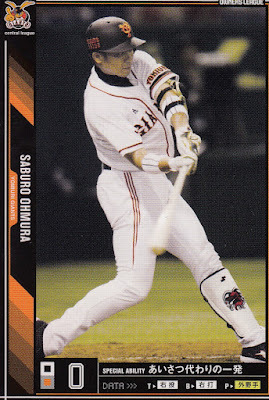 The base set has 128 cards - 36 OB baseball players, 36 active baseball players, 55 athletes from other sports and a checklist. There's four 18 card insert sets (Glorious 3D, Stay Gold, Super Star and Sparkling Hero) and a wide variety of autograph cards (which of course was the reason for the set). It'll be out in late October. 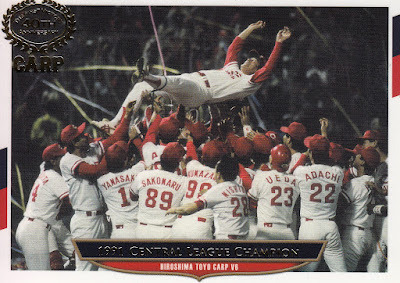 - Normally if the SCM card is a promo card it has the number from the set it's a promo for on its back. None of these do which makes me wonder if they're some sort of bonus card instead. 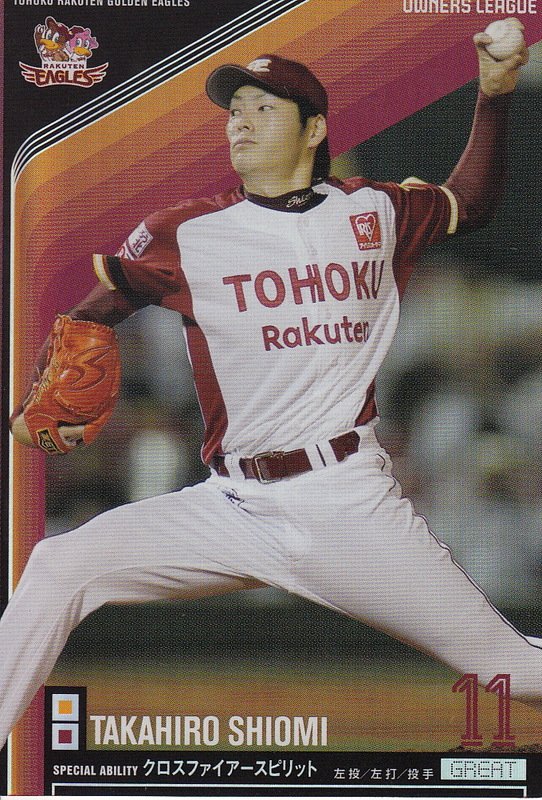 I do know that all three baseball players are in the set (Nagashima is card #022, Kanemoto is #027 and Yamada is #057). 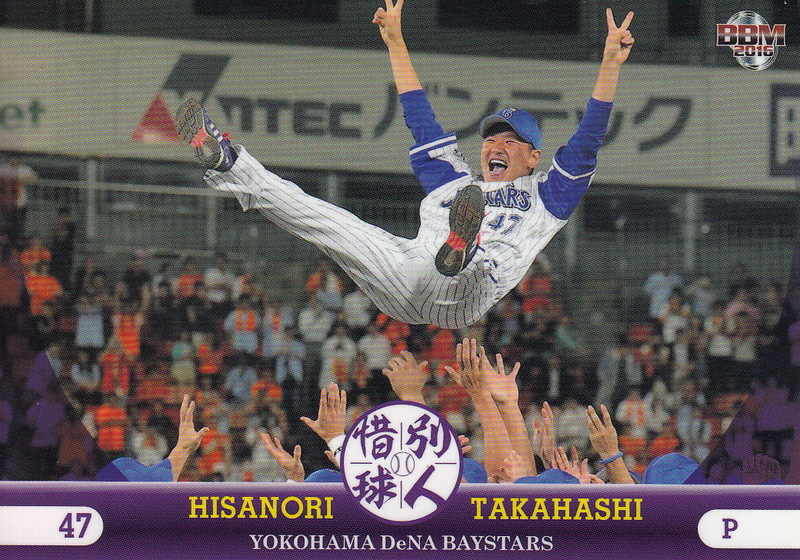 The Yokohama DeNA Baystars clinched a playoff spot last week, This is the first time that the Baystars have made the Climax Series since the Central League adopted the playoff format in 2007. 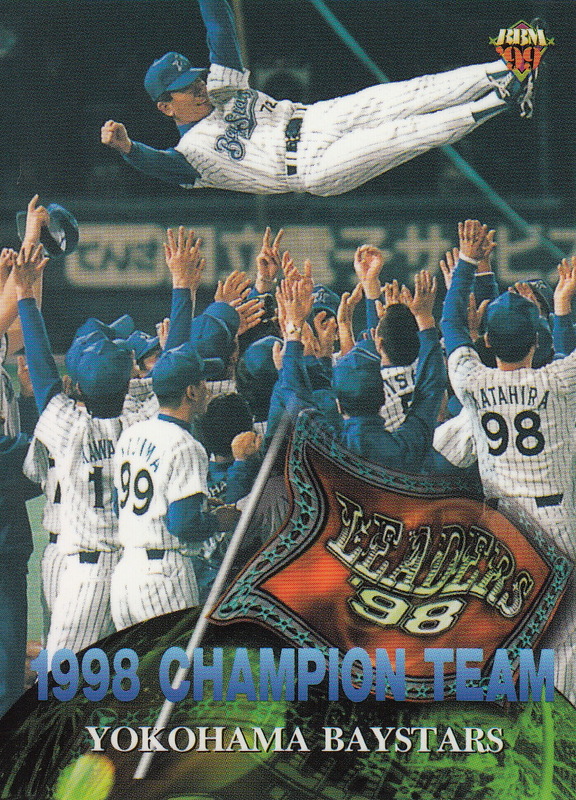 The last time the Baystars played beyond the end of the regular season was 1998 when they defeated the Seibu Lions in the Nippon Series. 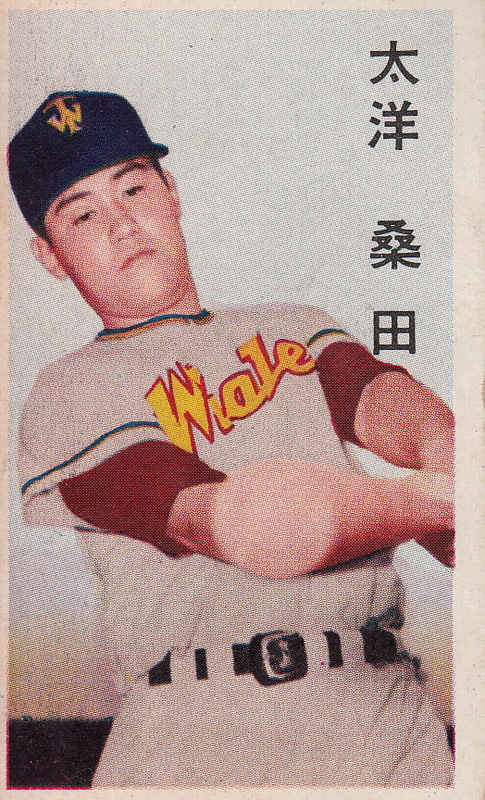 This was only the second time that the franchise had appeared in the Series - the only other time was 1960 when they were known as the Taiyo Whales and defeated the Daimai Orions. 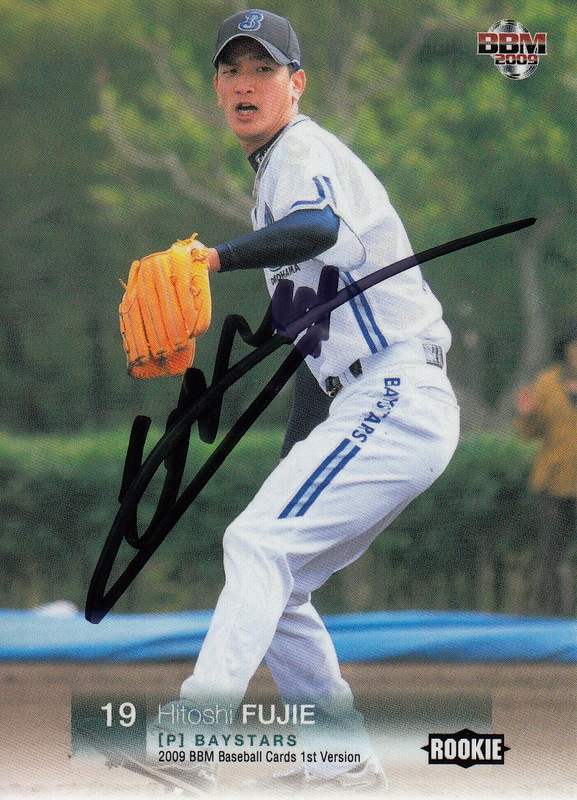 I mentioned the other day that I had gotten a package from Ryan the other day. Among the goodies were four recent box sets - well, I say "recent' but most of them were actually from late 2015 - early 2016. I thought I'd talk briefly about all four of them. 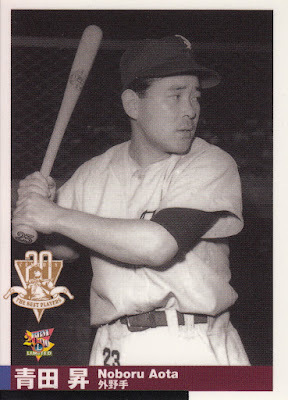 First up is the 2015 Epoch "Swallows Victory Memorial" set from last fall. 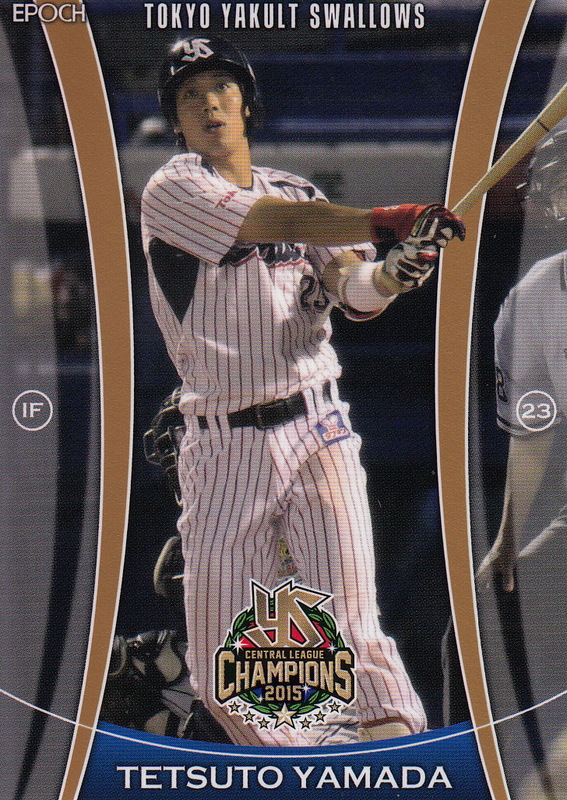 This set commemorates the Swallows 2015 Central League pennant. 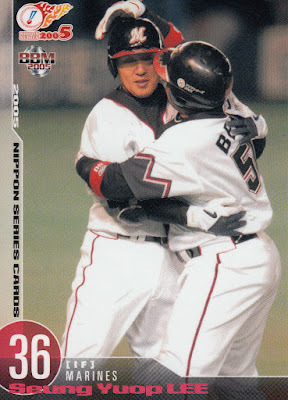 The base set has 30 cards - 28 cards of the Swallows players such as Tetsuto Yamada, Wladimir Balentien, Tony Barnette, Shingo Kawabata, Kazuhiro Hatakeyama and Yasuhiro Ogawa, 1 card for manager Mitsuru Manaka and 1 card showing the team's celebration after clinching on October 2 last year. 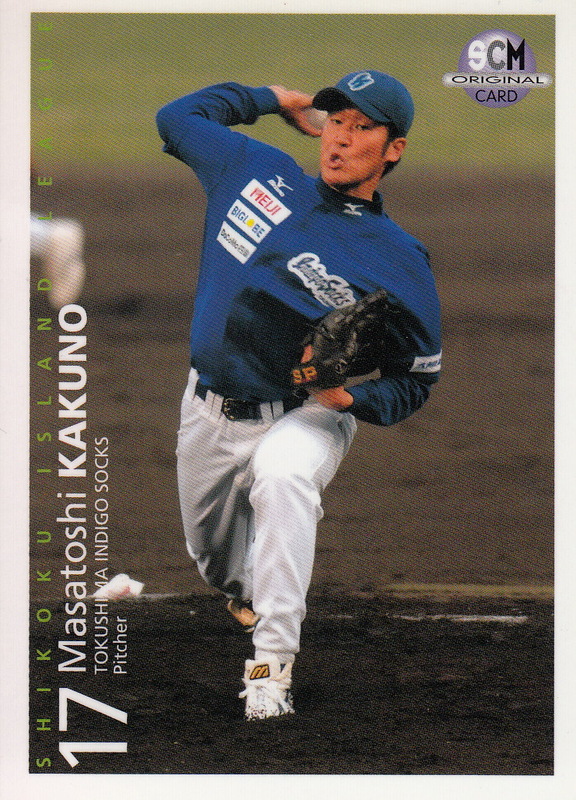 I don't think much of the card design - it's a little busier than I like - but I thought the actual photos Epoch used were quite good. 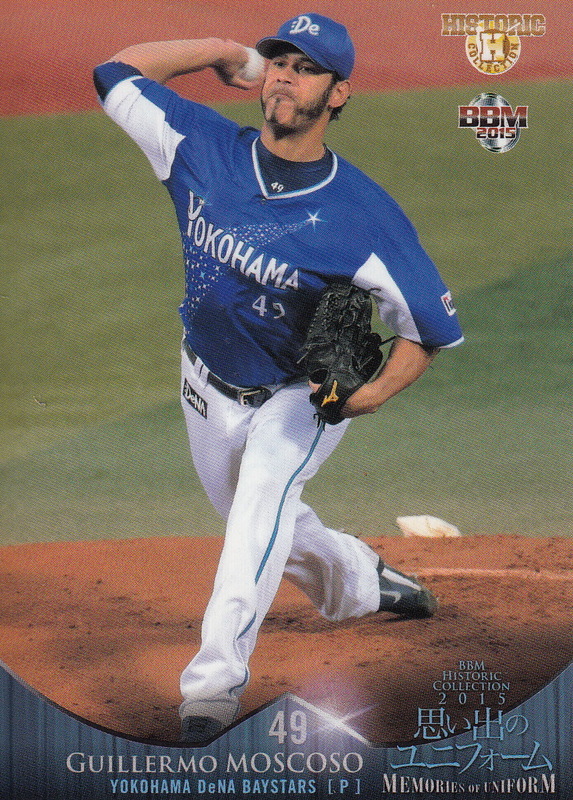 You can see all the cards at Jambalaya. 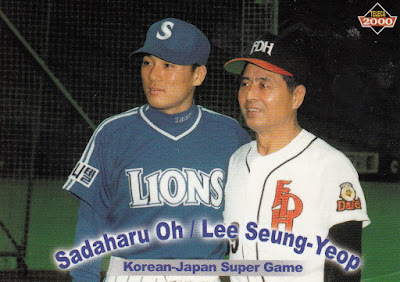 In December BBM put out a box set called something like "Spirit Of Legends" that exclusively featured pitchers who had won the Sawamura award. This sounds like a good idea (and is the kind of theme that Epoch has featured in several of the box sets they've done with the OB Club) but I'm not real impressed with the execution of it. As is pretty much typical of a BBM OB set, most of the 36 players featured in the set played in the 1970's or later. Actually pretty much every Sawamura Award winner since 1970 is in the set - the only ones missing are Kazumi Takahashi, Shigeru Kobayashi and Hideo Nomo. 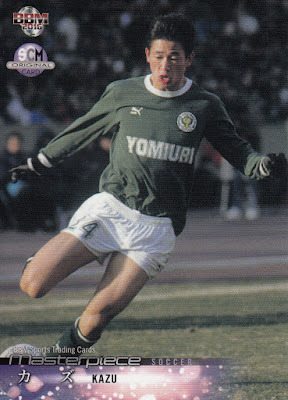 But there's only a handful of the earlier ones - Shigeru Sugshita, Masaaki Koyama, Gene Bacque and Hiroshi Gondoh, leaving out guys like Yutaka Enatsu and Masaichi Kaneda. Most of the OB players in the set have appeared in other recent BBM sets. 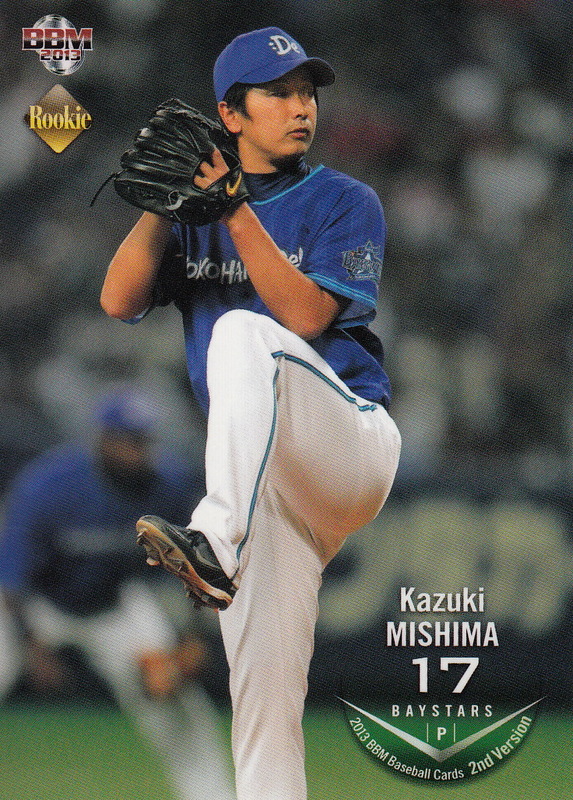 A number of the players included are currently playing in the US - Yu Darvish, Hisashi Iwakuma, Kenta Maeda, Masahiro Tanaka and Koji Uehara. I guess I just feel the set's a bit uninspired - the design is kind of blah and many of the photos are grainy. You can judge them yourself by taking a look at the cards over at Jambalaya. BBM issued their annual set for retiring ballplayers in January. 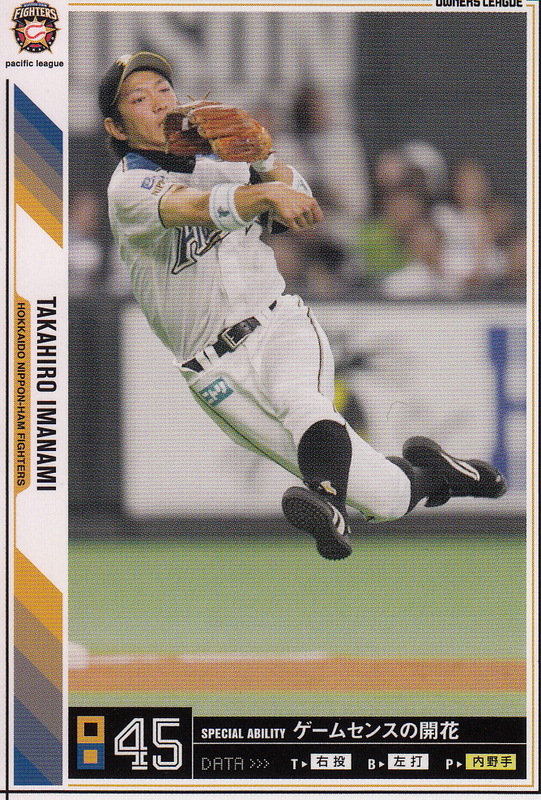 I call this set "Farewell" but the translation of the official title is something along the lines of "Regret at Parting Ball Players". 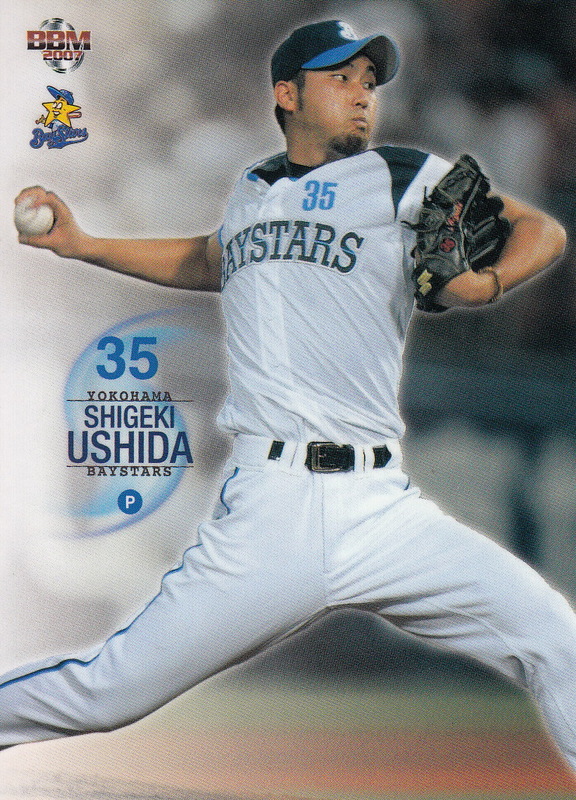 This year's edition has 38 cards featuring 38 different players (as opposed to previous years which featured multiple cards for certain players). 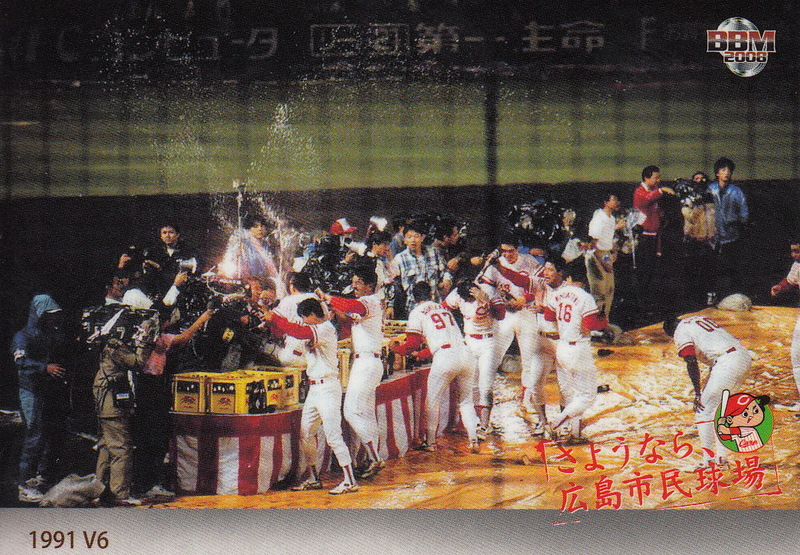 Everyone you'd expect to be in the set is there - Masahiro Yamamoto, Yoshinobu Takahashi, Motonobu Tanishige, Michihiro Ogasawara, Kazuhiro Wada, Fumiya Nishiguchi, Satoshi Nakajima, Hirokazu Ibata. There's not really a lot to say about this set - the photos all seem to be from last year. 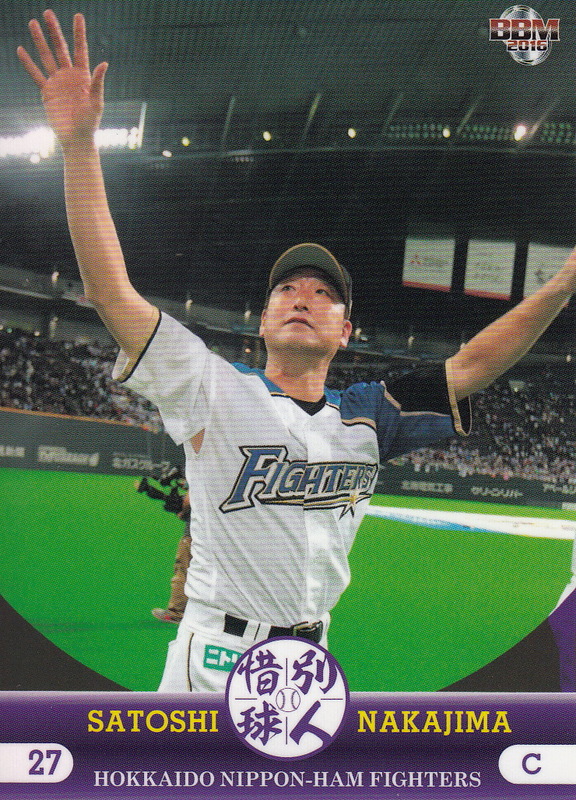 Many of them are from the retirement ceremonies for the players. 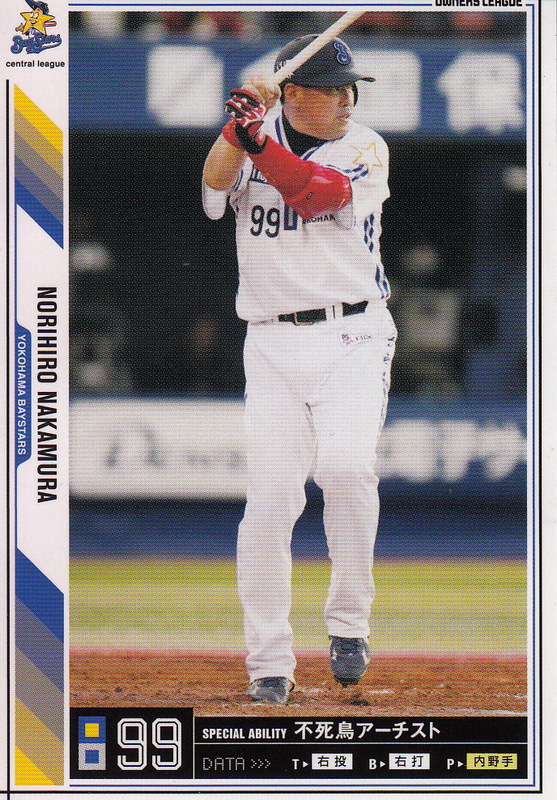 Notably missing is Nobuhiko Matsunaka because he didn't officially announce his retirement until February - a month after this set was released. 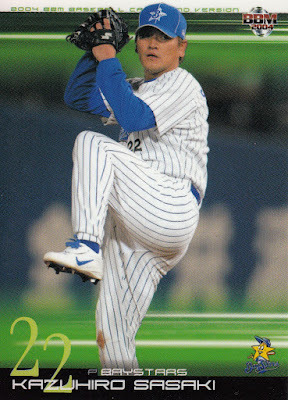 I assume he will be in this winter's version of the set. 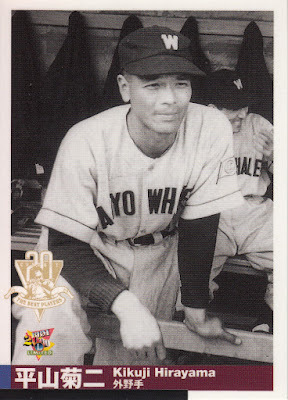 Jambalaya (as usual) has all the cards from the set on-line. 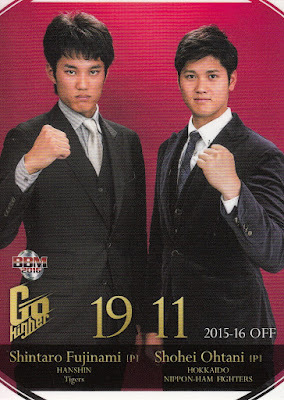 The final box set that Ryan picked up for me is the "Go Higher" set that BBM released in June. This set features Shohei Ohtani of the Fighters and Shintaro Fujinami of the Tigers. 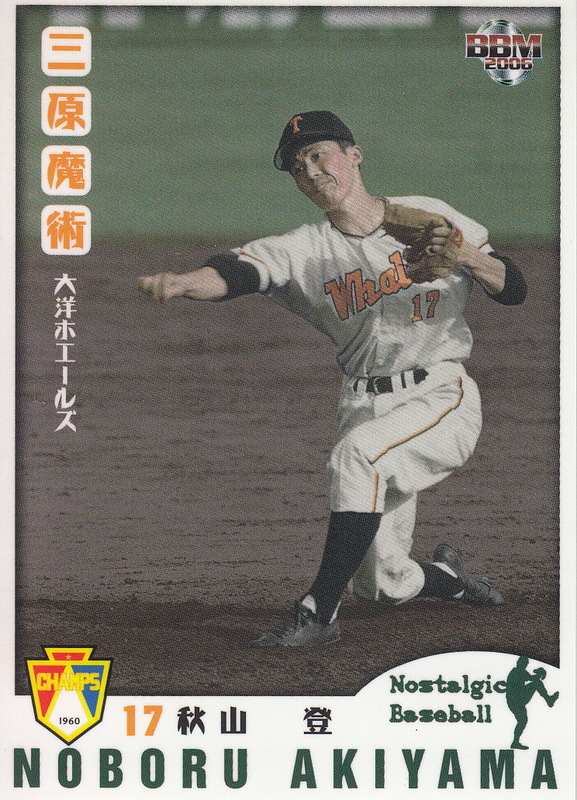 The 18 cards in the set include seven of each player and another four showing both of them. 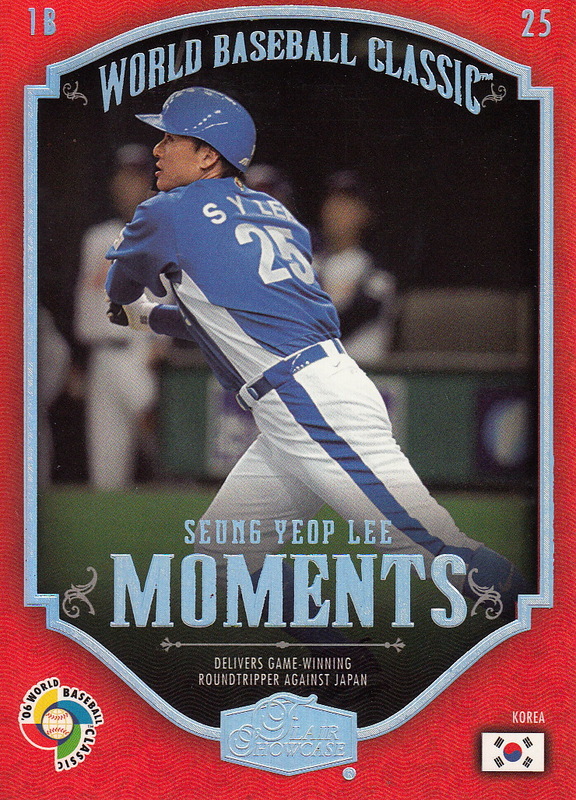 Each card commemorates various events in the player's careers - their draft in the fall of 2012, each player's debut, first post season appearance, etc. 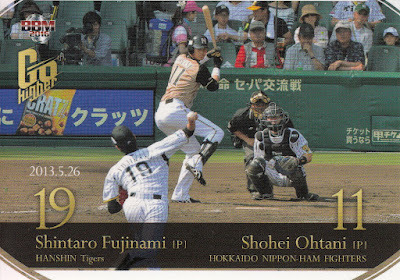 I really like the card showing Ohtani batting against Fujinami (card # 5 from above) but the whole set is pretty nice. Once again you can see all the cards in the set at Jambalaya. 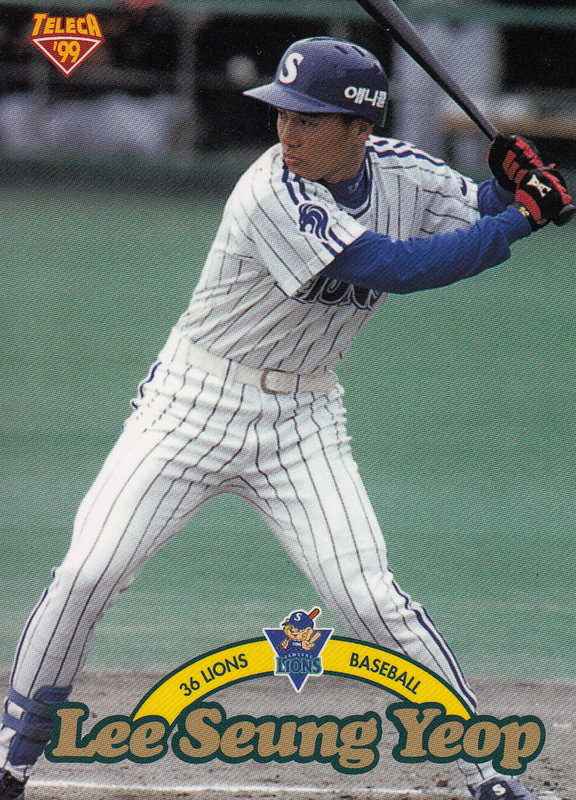 The Shikoku Island League was the first independent minor league in Japan. It started up in 2005. 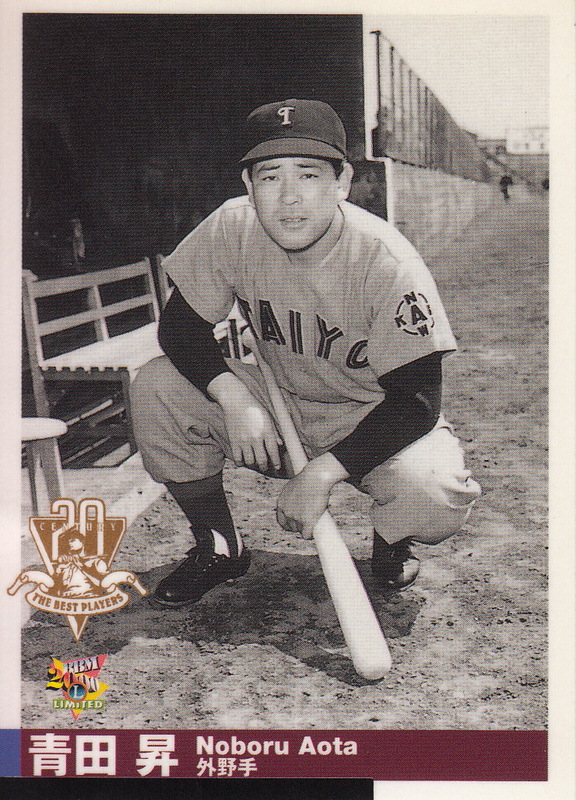 While there's been sets issued for each team over the years (in a similar manner to how US minor league teams issue team sets), BBM has never issued much in the way of cards for the league. From what I've been able to tell, BBM has only issued three cards for the league - all of which were inserts in Sports Card Magazine. I just got a package from Ryan yesterday and among the goodies in it were two of these three cards (and I had gotten the other one in a trade last years). I don't know anything about Kakuno but Hayashi led the league in batting that season with a .322 average. Neither player appears to have ever played in NPB (there was another Masaki Hayashi who played for the Carp from 2001 to 2011). 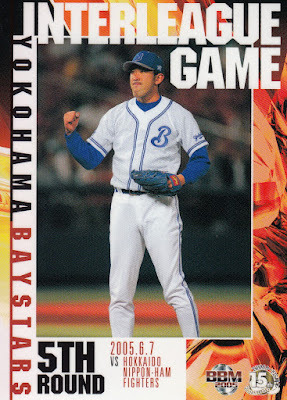 It's possible that these two cards are promos for a BBM Shikoku Island league set but I've never seen or heard of one. One the other hand, I had never seen or heard of BBM's cards for the GPBL until Ryan found them last year so maybe there is one. Lee joined the Samsung Lions in 1995 and became a regular almost immediately at the age of 18. 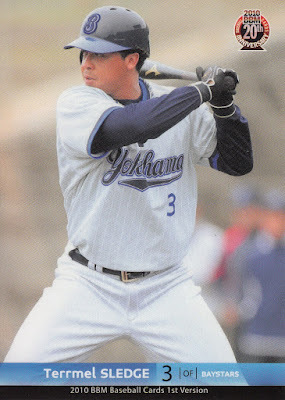 He had his breakout season in 1997 where he hit 32 home runs and had 114 RBIS, leading the league in both categories for the first time. 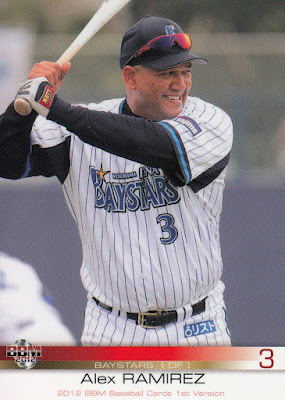 He stayed with Samsung through the 2003 season, leading the league in home runes four more times and RBIs three more times. He set a KBO (and at the time Asian baseball) record with 56 home runs in 2003. Following that season, he signed with the Chiba Lotte Marines and headed for Japan. Lee spent his first two season in Japan with the Marines. He had modest numbers his first season but hit 30 home runs with 82 RBIs in his second season while helping Lotte win the Nippon Series. 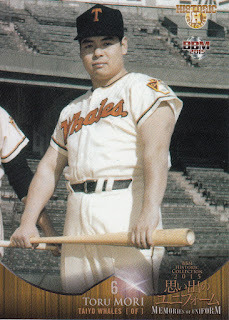 He hit .545 with 3 home runs and 6 RBIs in the Marines' four game sweep of the Tigers and received one of the three "Outstanding Player" awards for the Series. 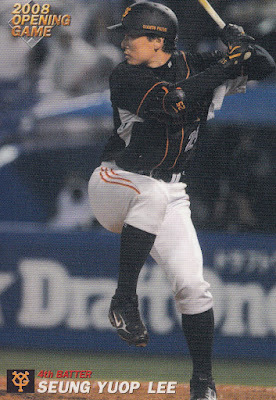 He left the Marines and signed with the Yomiuri Giants for the 2006 season. 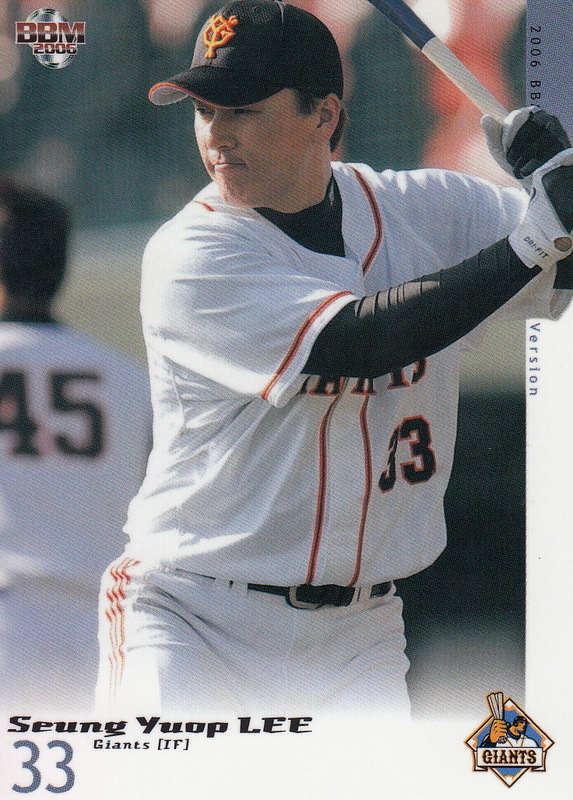 His first season with the Giants was his best season in Japan - a .323 batting average with 41 home runs and 108 RBIs. He followed that up with another 30+ home run season in 2007 but a number of circumstances (injuries, the 2008 Olympics and I think the foreign player limit on the active roster) started taking playing time away from him after that, although he did appear for the Giants in both the 2008 and 2009 Nippon Series. 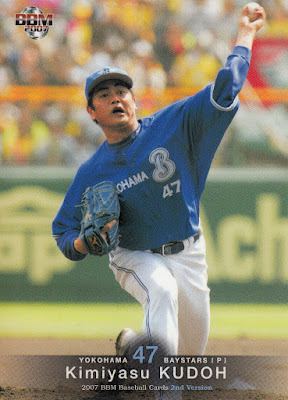 The Giants released him following the 2010 season. 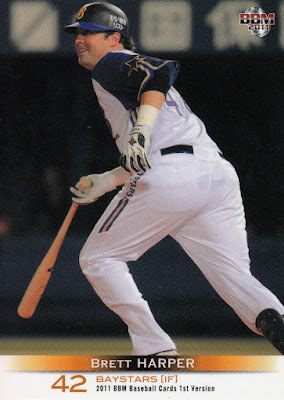 He signed with the Orix Buffaloes for the 2011 season, hitting only .201 with 15 home runs and 51 RBIs. After the season he returned to Samsung and the KBO. 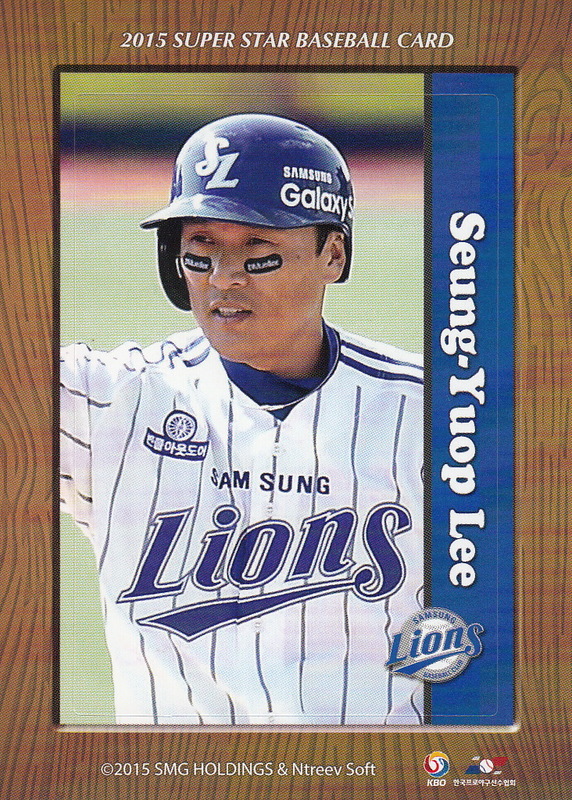 Lee has pretty much returned to form in the past five seasons with Samsung. 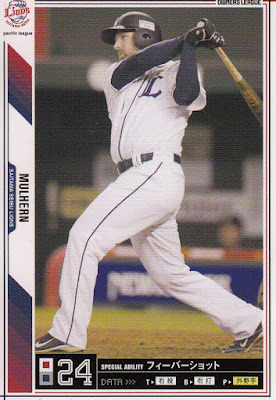 He's hit over .300 with at least 20 home runs each season except for 2013. He is the all time KBO home run leader with 441 (as of last Wednesday). 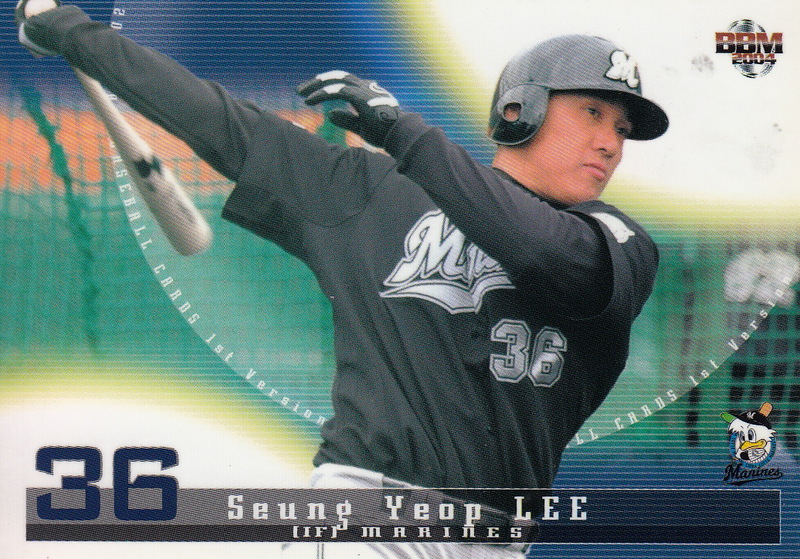 Lee has played for the Korean national team in two Olympics -2004 and 2008 and also played for them in the 2006 World Baseball Classic. 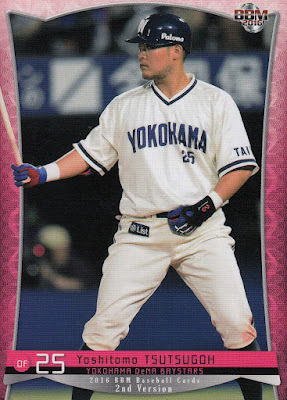 He hit five home runs in the 2006 WBC but none of them was a big as the two run shot he hit against Japan in the last game of Round 1 in the Tokyo Dome. For more cards of Lee, check out Dan Skrezyna's page for Lee on his KBO Cards blog. 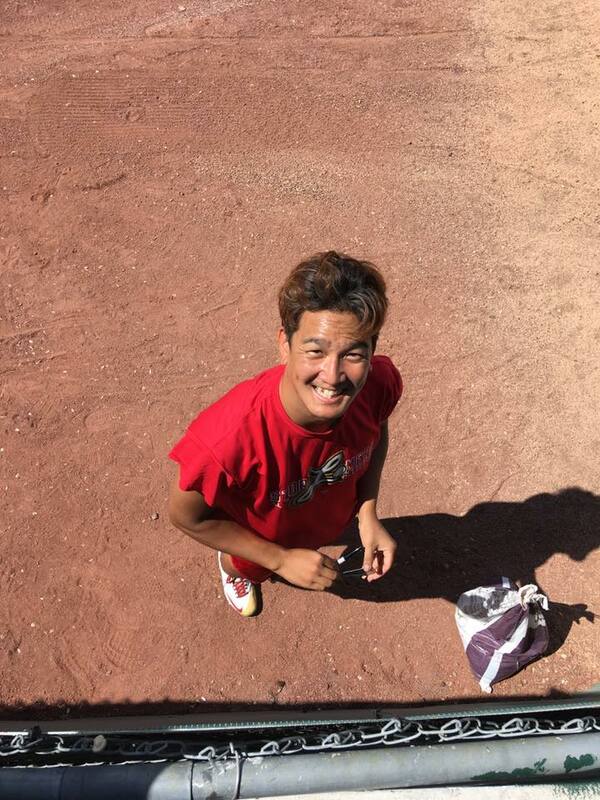 H/T KBO Reddit for the video. That's manager Koji Yamamoto getting tossed in the air on the Epoch card. If the Carp go to the Nippon Series this season it'll be the first time they've ever done it without Yamamoto in uniform - he was a player when they went to the Series the first five times and the manager the sixth. 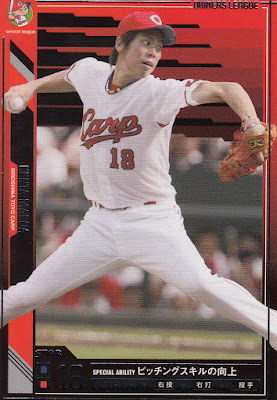 I want to point something out about the Carp's 1st place drought but I need to clarify something first. When the Central League added playoffs in 2007 NPB decided that the pennant winner for each league would be the team that finished first, regardless of whether or not that team won the playoffs. So if you look at a list of Central League pennant winners, you'll see that the Giants are listed as the pennant winners in 2007 and 2014, despite the fact that the Dragons and Tigers won the playoffs in those two seasons and represented the league in the Nippon Series. 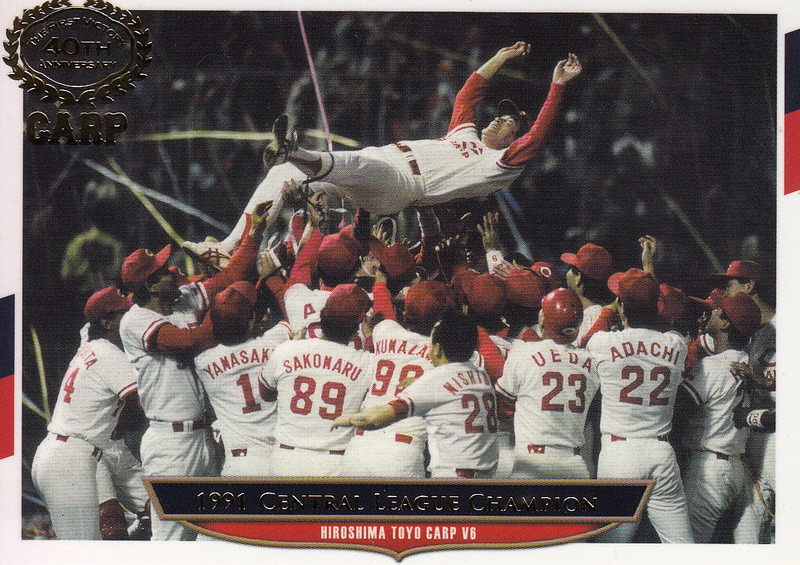 So by virtue of this rule, the Carp are the winners of the 2016 Central League pennant. Their 25 year pennant drought was the longest current drought in the NPB (the new longest pennant drought is owned by Orix who last won in 1996 - I'm not counting Kintetsu's pennant in 2001 since Orix is not honoring Kintetsu's retired numbers). There's a key thing to remember in NPB's definition of pennant winner - they started it in 2007 when the Central League adopted playoffs. 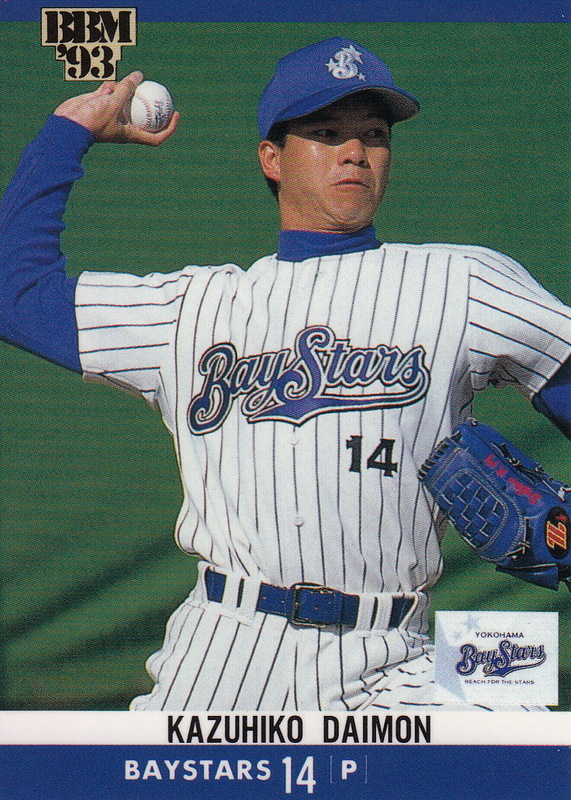 But the Pacific League had started doing playoffs three years earlier in 2004. 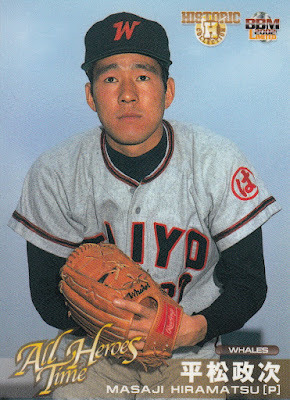 For those three years, the team that won the playoffs was considered the pennant winner (and just for completeness so were the teams that won the split-season playoffs the Pacific League had from 1973 to 1982). 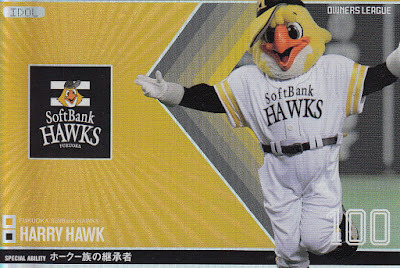 In 2005 the Hawks finished first but lost to the second place Marines in the playoffs. 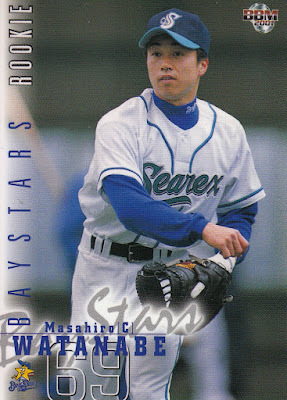 Thus the Marines were the 2005 Pacific League pennant winners. 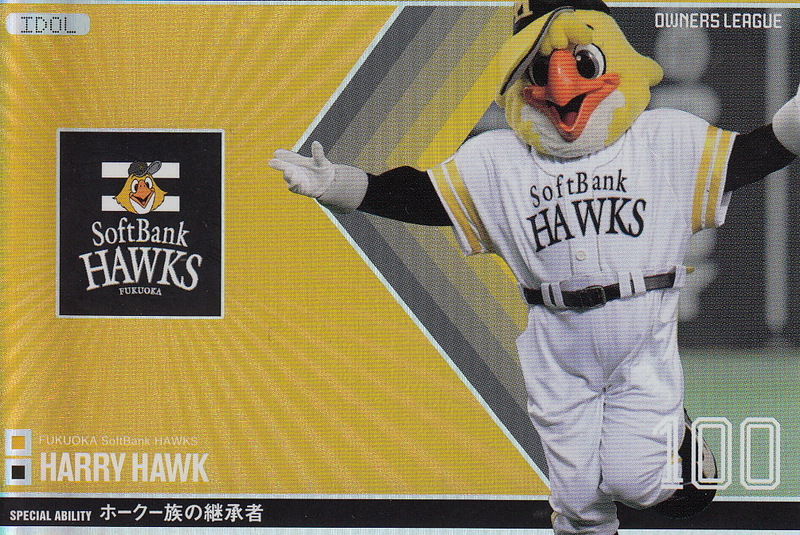 In 2010, the Hawks again finished first and again lost to the Marines in the playoffs. 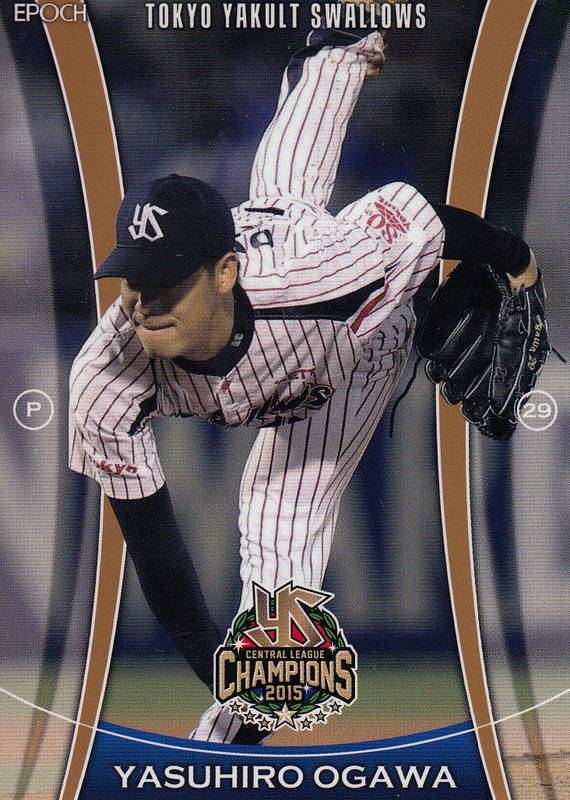 But because the definition of "pennant winner" had changed in 2007, the Hawks were the 2010 Pacific League pennant winners. 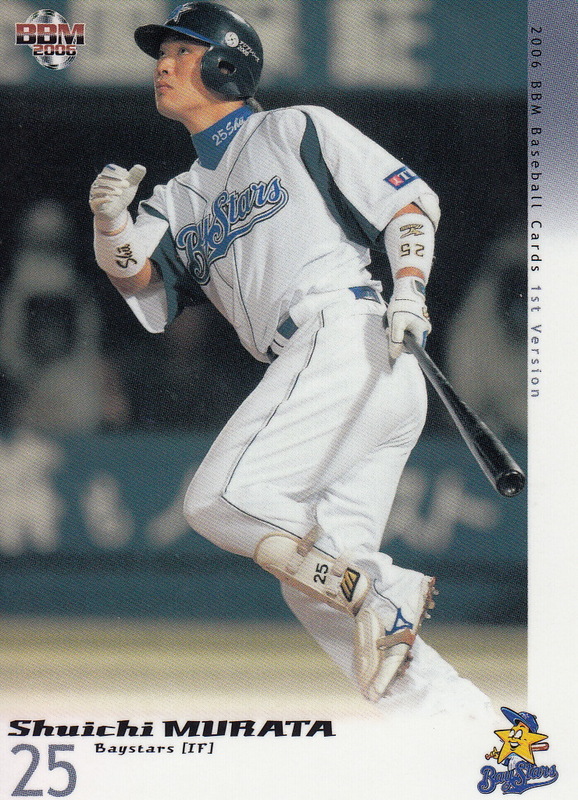 I say all this because I want to point out that while the Carp had the longest current pennant-less streak in NPB until yesterday, they did not have the longest current streak of non-first place finishes. That streak belongs to the Chiba Lotte Marines, who last finished first in 1974 (when they were the Lotte Orions). 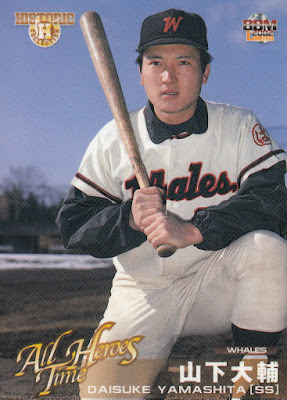 And actually that really shouldn't count - as I mentioned above the Pacific League had a split season from 1973 to 1982 and Lotte only finished first in the second half of the season before defeating Hankyu in the playoffs - although to be fair they did have the best overall record in the league that season. 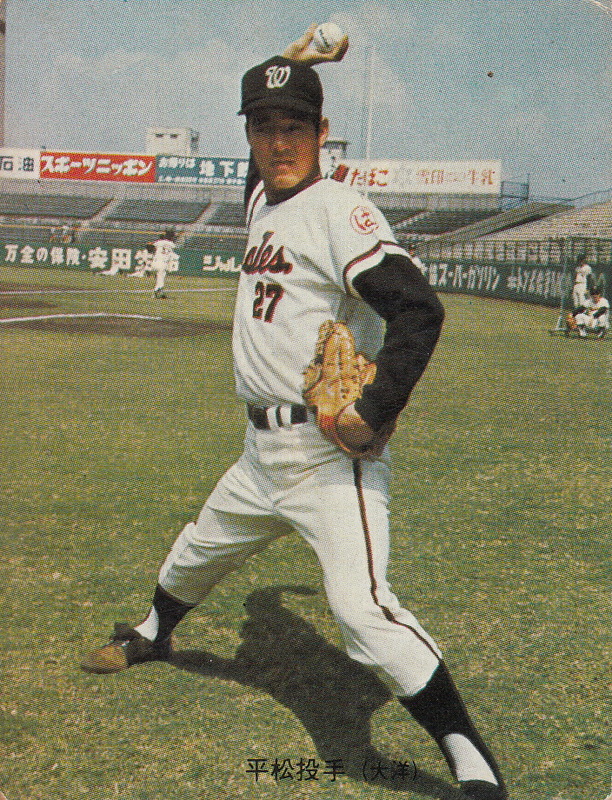 (They also finished first in the second half of the 1977 season and first halves in 1980 and 1981 but lost in the playoffs all three times.) The last time Lotte finished first in a full season was 1970. 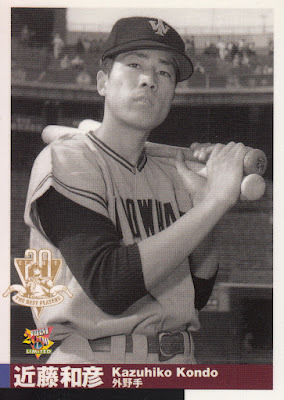 - Hitting the stores today is the latest of BBM's Authentic Edition team box sets. 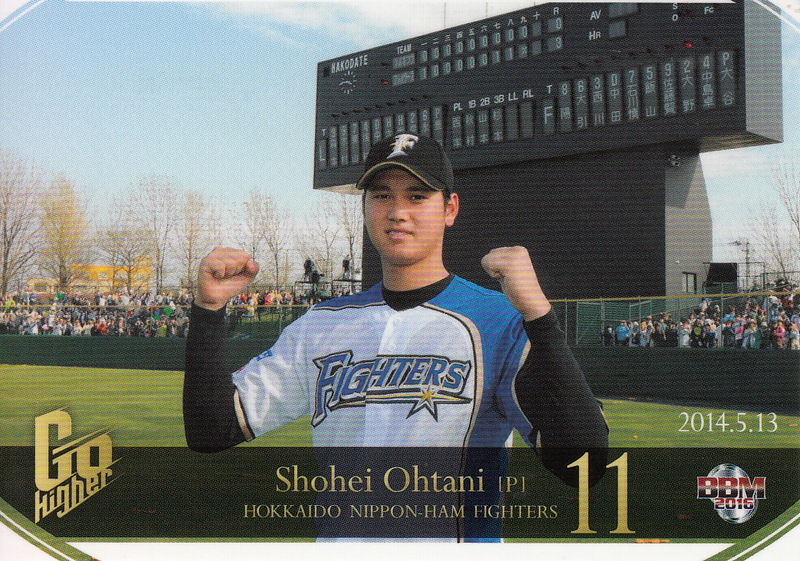 This one is called "CLIMAX" and features the Hokkaido Nippon-Ham Fighters. 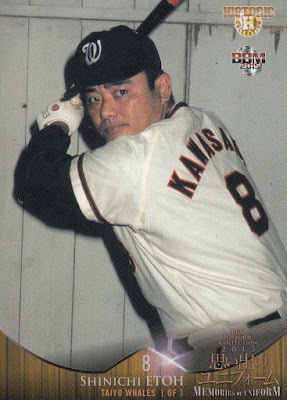 Each box contains 31 cards - the 30 card base set plus one "special" card which may be an autograph or memorabilia card - including jersey and patch cards. 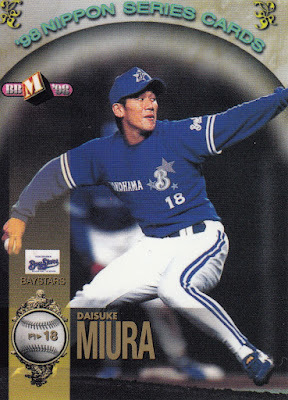 There are multi-player jersey cards available. 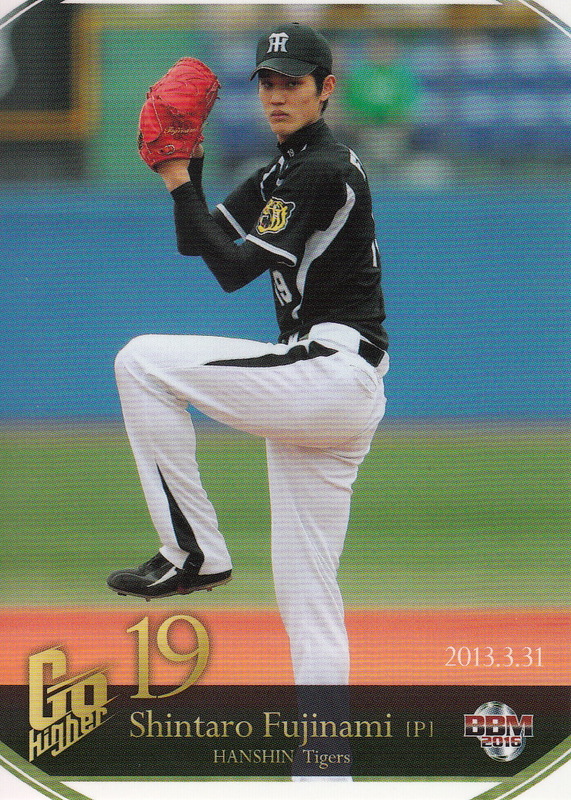 You can check out the base set at Jambalaya - the Shohei Ohtani card has him both batting and pitching. 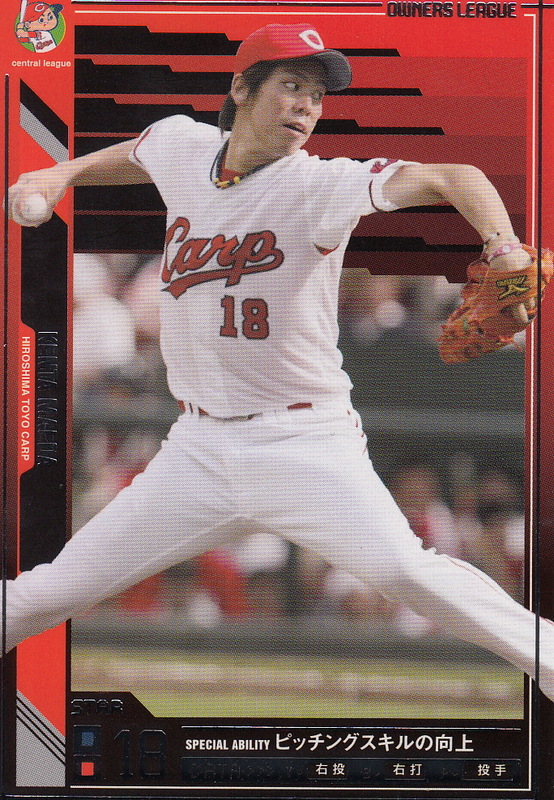 - BBM's putting out another team box set on September 15 - this is the latest Autograph Edition set and it's for the Carp. The set is entitled "Katsukoi". Each box contains 28 cards - a 27 card base set plus one autographed card. 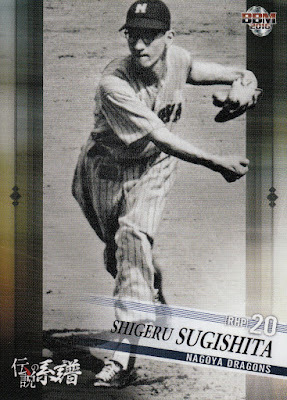 Multi-player autograph cards are possibilities. - For the third year in a row BBM is releasing a box set dedicated to a team's cheerleader/dance squad. This year it's for Giants Venus, Yomiuri's cheerleaders and is called "Original Smile". The box contains 44 cards - 42 cards from the base set plus two "special" cards which could be autograph cards (including multi-person autograph cards), facsimile autograph cards and memorabilia cards. 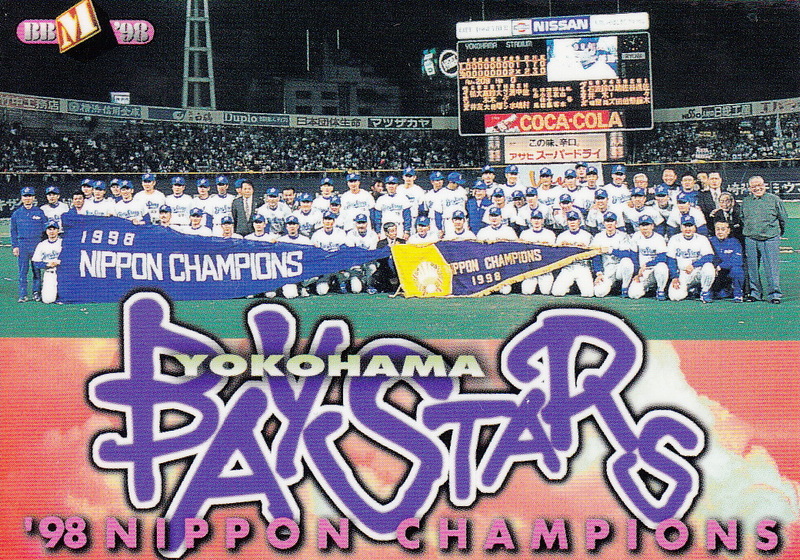 The base has 19 cards of the team members in their costumes, 19 cards of the team members wearing yukata and four cards that are group photos. 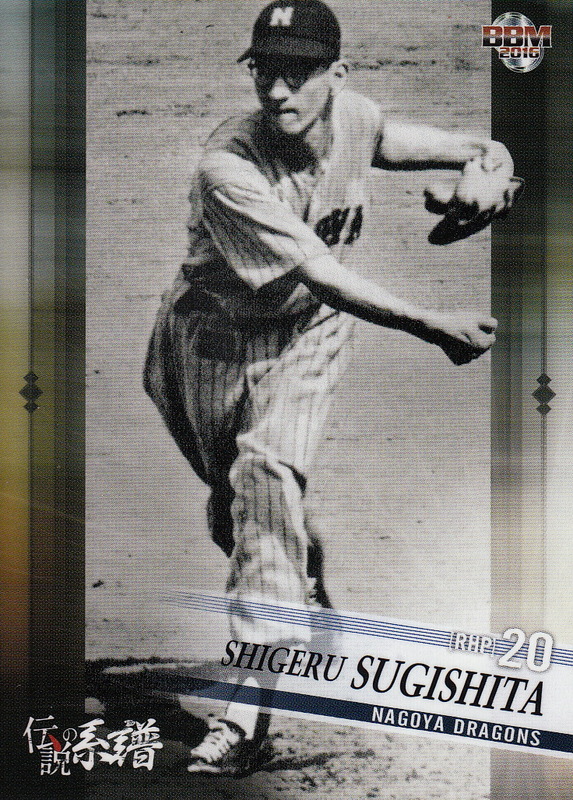 The box also contains a "raw photo" that I think is essentially a parallel of one of the 38 cards that show a single team member. The set will be released on September 15. 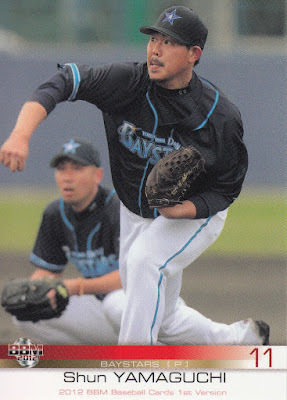 - Epoch has three high end team sets coming out in the next month or so. 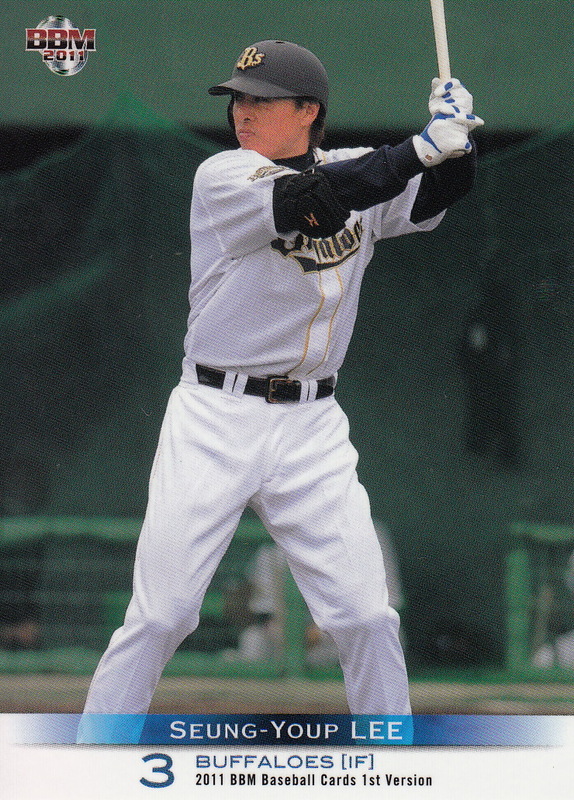 The Swallows "Shadow Box Edition" will be out on September 24. 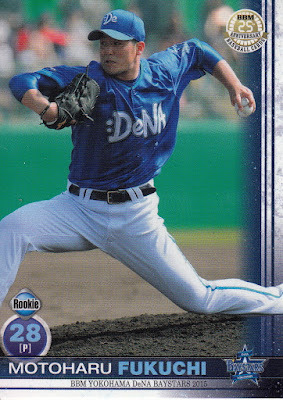 It looks like one box (at 11,200 yen) only has five cards in it but it's not clear to me what the breakdown of those five cards is. I think there's three base cards and two "special" cards but I'm not sure. There are 27 possible cards in the base set and a bewildering variety of autograph and memorabilia cards available. The Carp "Stars & Rookies" set will be released on October 8. One box of this (MSRP of 11,200 yen) contains one 12 card pack containing 10 base set cards (of a possible 42) and either a parallel card and a "special" card or two "special" cards. 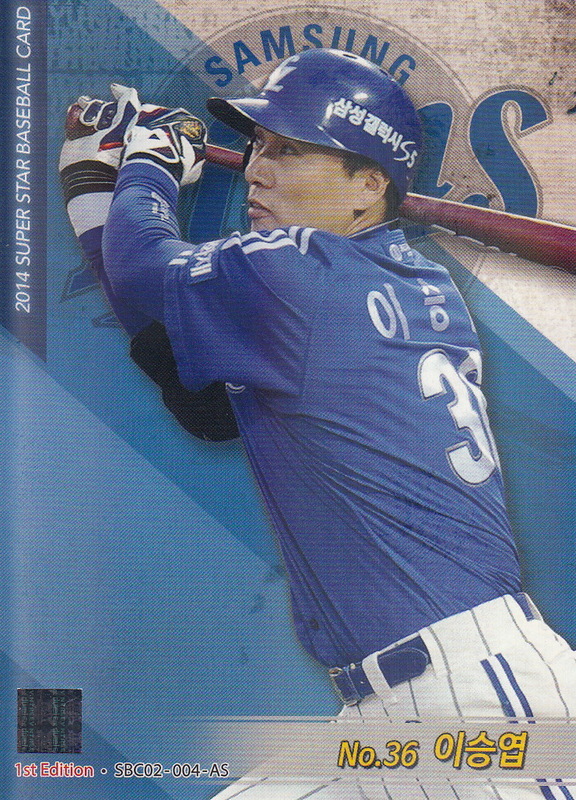 The "special" cards could be autograph or jersey cards. The Fighters "Season Achievement" set will be out on October 22. 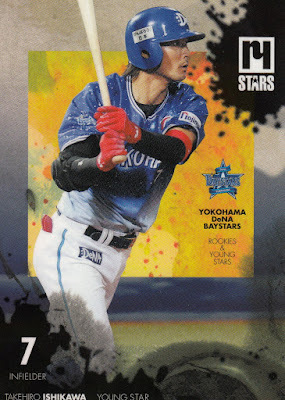 Each box (MSRP of 11,700 yen) contains one 10 card pack - five base set cards (of a possible 36), one regular parallel card, one holo "Spectra" card, one "Crystal" die cut cards and two "special" cards - possibly autograph or jersey. 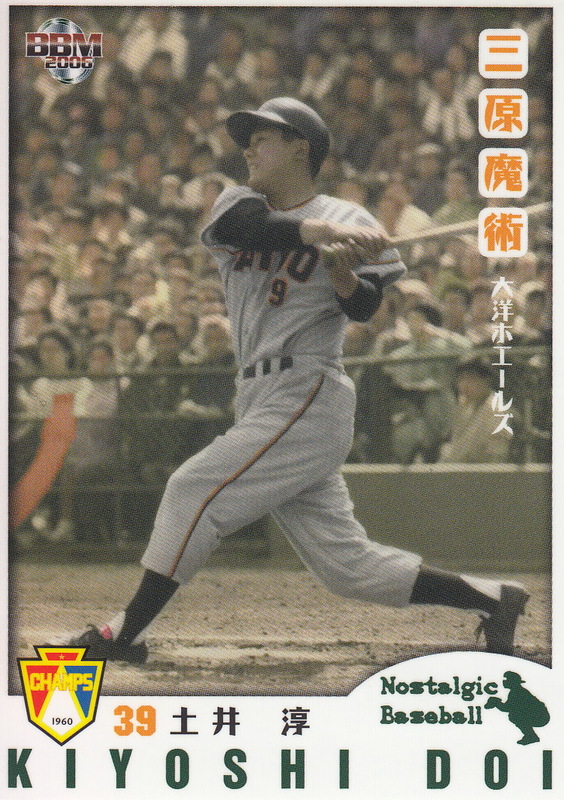 - On the more affordable end of the spectrum, Epoch is also releasing a set for the Japan Woman's Baseball League (JWBL) on October 10th. 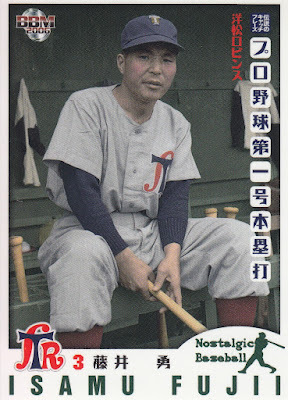 This is a more traditional pack based set (each box contains 20 packs of five cards each). There are 78 cards in the base set and possible autograph and "cheki" cards (not quite sure what those are). This will be the first major card set for the JWBL since BBM did some sets in conjunction with the GPBL (as the JWBL was known then) back in 2010-11. 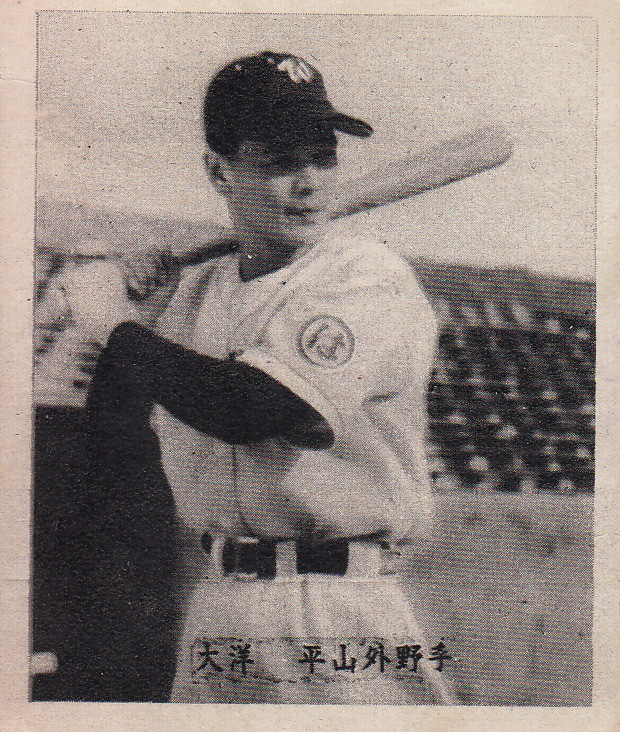 One of the new professional teams to join the Central League in its debut season of 1950 was the Taiyo Whales who played in Shimonoseki, Yamaguchi. 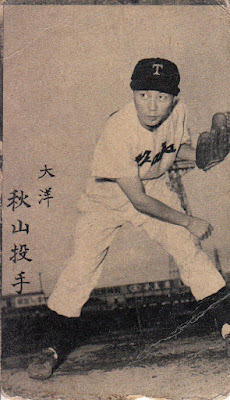 The team merged with the Shochiku Robins after the 1952 season and were known as the Taiyo Shochiku Robins for the next two seasons. 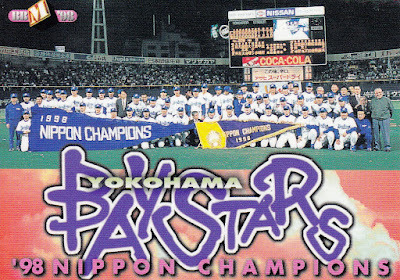 The team played their home games in Osaka those two seasons. Following the 1954 season Shochiku sold their interested in the team and the name reverted to the Taiyo Whales. 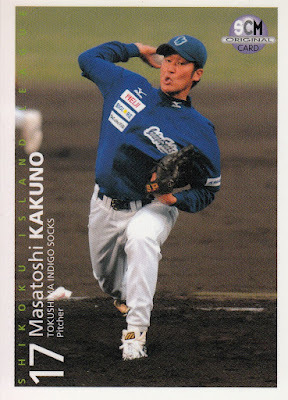 At this time the team moved to Kawasaki, Kanagawa where they would remain for the next 22 seasons. 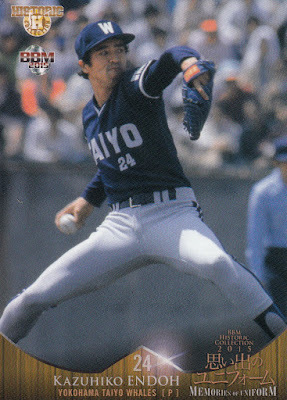 The team moved a little south to Yokohama in time for the 1978 season and became known as the Yokohama Taiyo Whales. 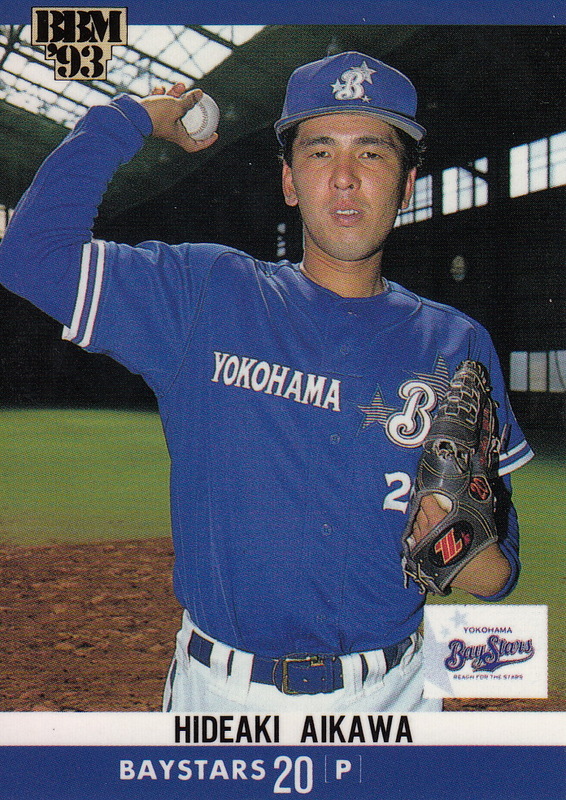 The team name changed to the Yokohama Baystars following the 1992 season due to the parent company changing their name from Taiyo to Maruha. 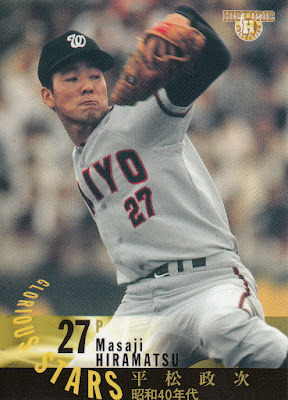 Maruha sold the team to the Tokyo Broadcasting System (TBS) in 2001 but the team name remained the same. TBS sold the team to DeNA prior to the 2012 season and the team name became the Yokohama DeNA Baystars. I rounded up the usual suspects as my sources for this - The History Of Uniform, Professional Baseball Uniforms Encyclopedia 1936-2013 and the uniform posts from Yakyu Baka and Yakyu DB. NOTE - I list all the uniforms I've identified, even ones that I don't have cards for. Don't panic - the blank spots don't mean there's a photo your browser isn't loading. 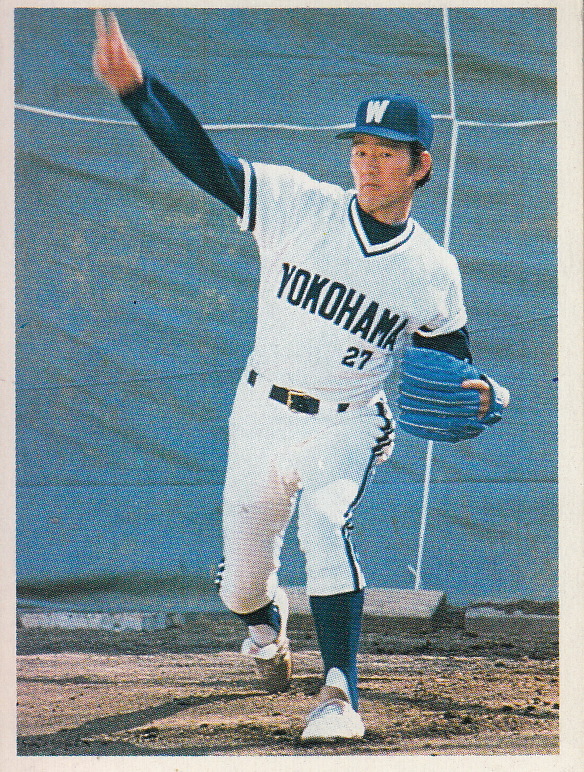 I think I did pretty well on this one considering the multitude of uniforms and the fact that there really aren't any OB team sets for the Whales/Baystars that cover the years before 1978. Although I don't understand how I managed to do this without a card of Takuro Ishii. The only difference between the 1964-67 and 1968-72 uniforms are the hats. Same thing with the 1993-95 and 1996-08 uniforms (1996-05 for Away). 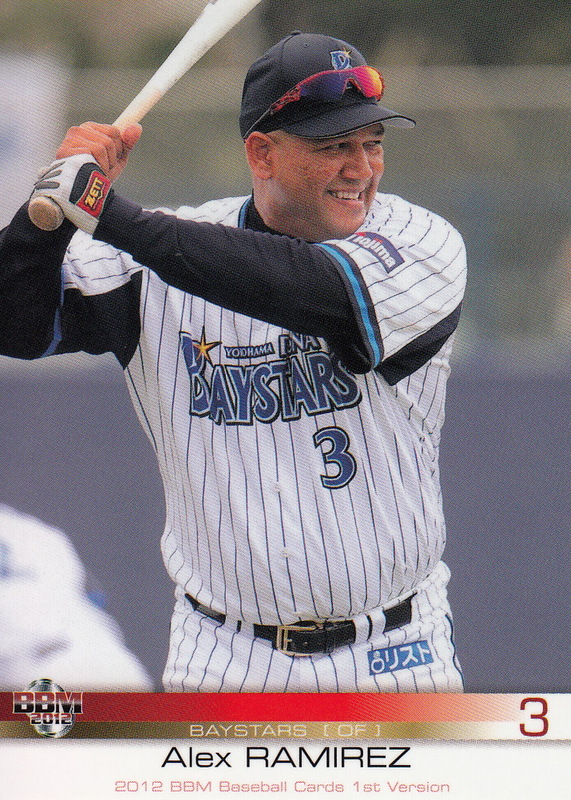 The Baystars also apparently had different hats that they wore in April and September of 2004. 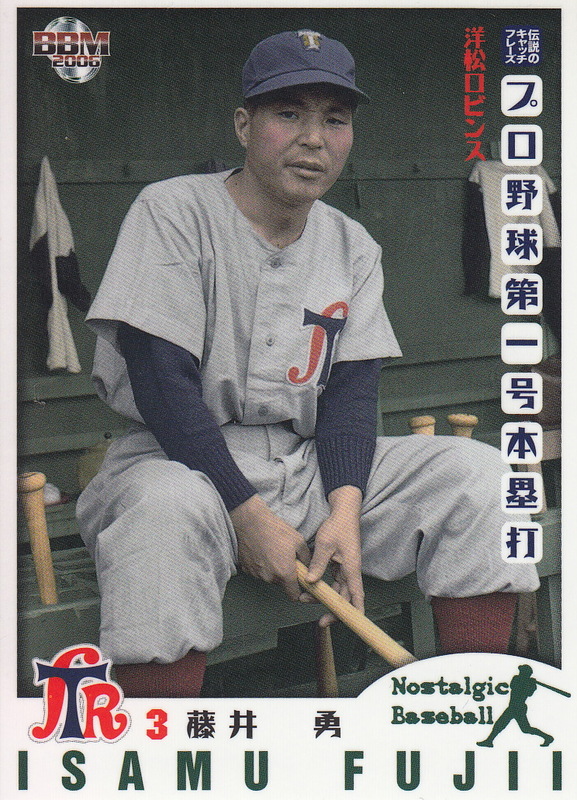 The colors are wrong on the uncataloged bromide I'm using for one of the 1950-51 uniforms. "Whales" should be in navy not red. 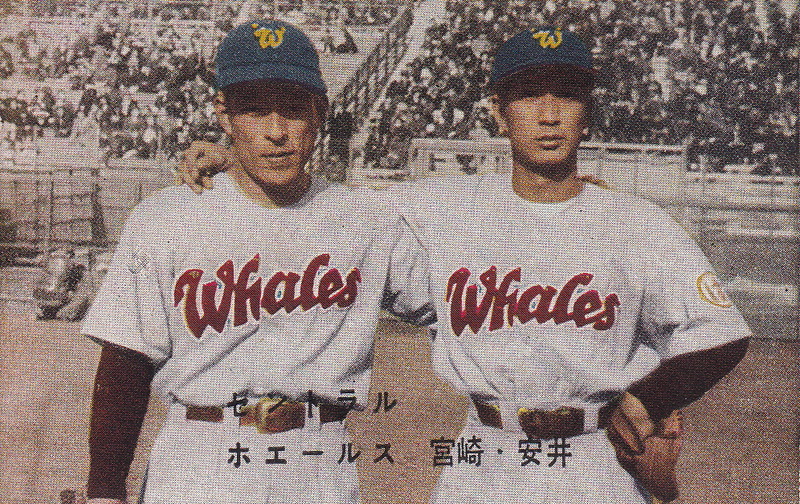 I believe that the Whales were the first Japanese team to have numbers names on the back of their uniforms. 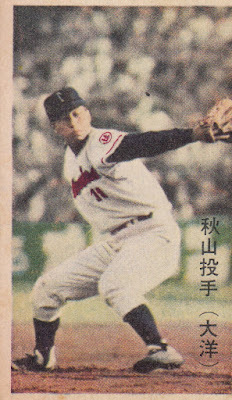 They started in 1964. 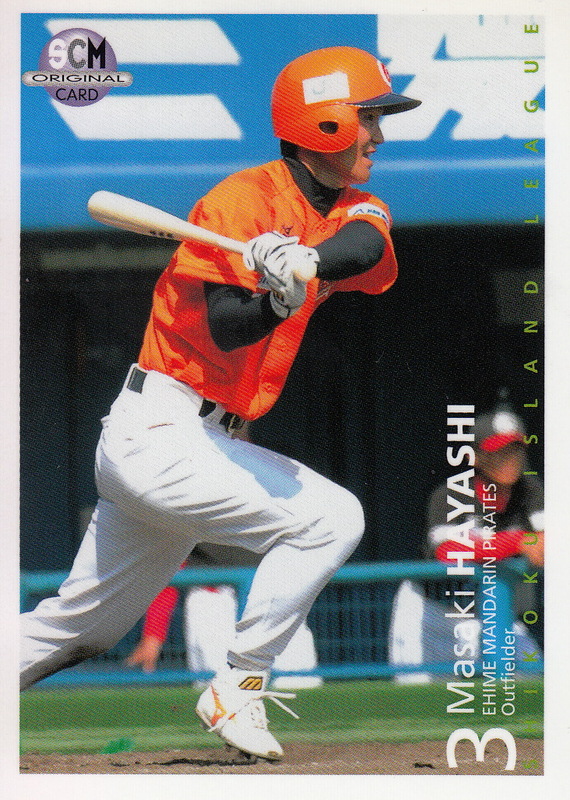 They also had a variant that had "Kawasaki" (the team's home city) on the back in place of the name. 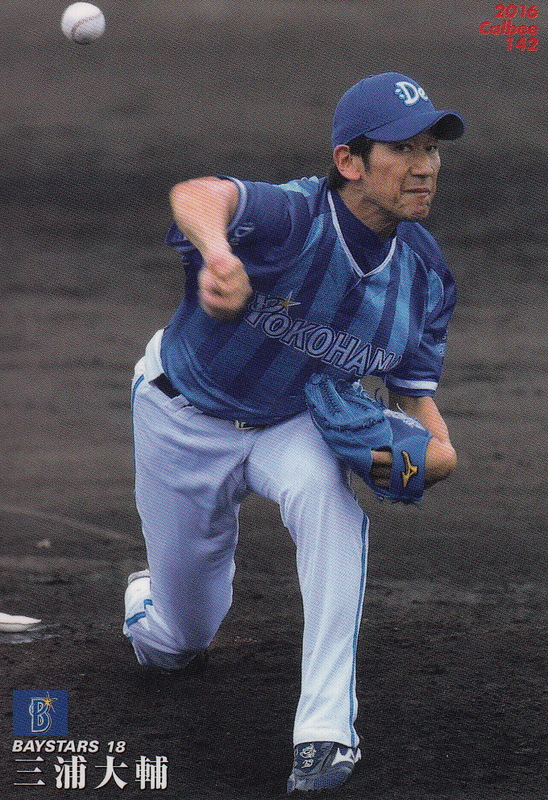 There's numerous differences between the illustrations in HOU and the photos in PBUE. For the most part I went with what PBUE said. I'm making a best guess on the cards I'm using for the 1973 uniforms. 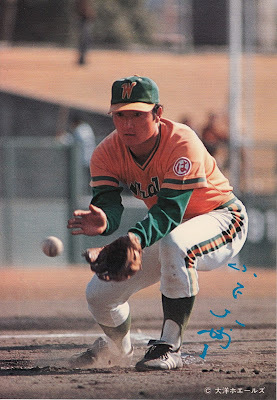 Daisuke Yamashita was a rookie in 1974 so I'm theorizing that he wore the 1973 uniforms in training camp that season. The Whales won the 1960 Japan Series and wore the patch you see on the left sleeve of Mori's jersey during the 1961 season. But Mori didn't join the Whales until 1962 and I've seen no pictures indicating that the Whales had a jersey at that time that did not have the player's uniform number on the front. All I can guess is that this was something he wore during training camp in 1962. 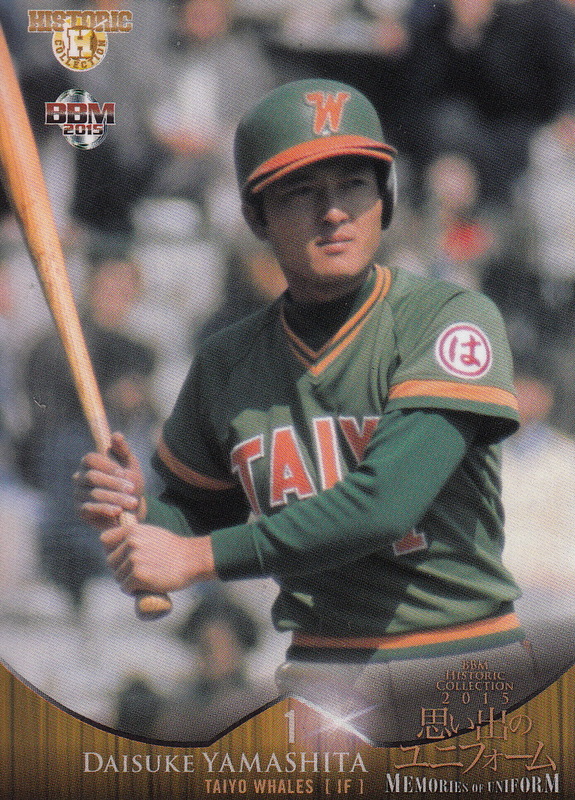 The uniform looks very much like the Away uniform worn between 1964 and 1972 but I've only seen that hat with the 1973 Home uniform. 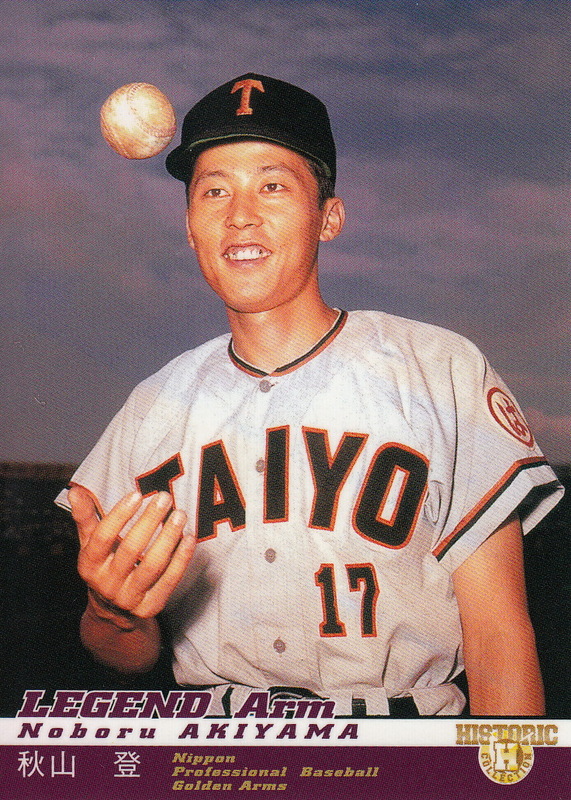 I've got no idea unless there simply was another hat used in those years (or at least after Hiramatsu's rookie season of 1967).